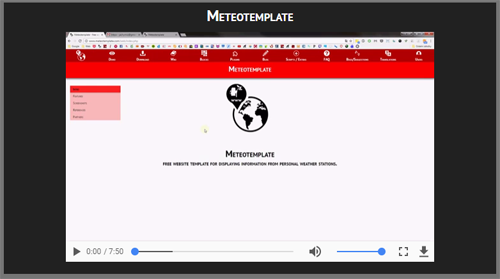 Don't forget to register at the forum, Meteotemplate related information is only visible to registered users and this is the best place to find help and chat about the template. This page is for downloading the individual blocks, including not just a download link, but also a description and screenshot of each along with the date of last update. Before you download any of these blocks make sure you read the corresponding section in the wiki, which will tell you how to install a block, put it on the homepage and also how to create your custom blocks. Also keep in mind that the screenshots below are based on the "grey/dark red" color scheme and dark scheme of the page. On your website they will show based on your selected color scheme and homepage theme. IMPORTANT: Please remember that if you are not using the latest template version, you should not add/update any blocks or plugins because there are likely to be compatibility problems. 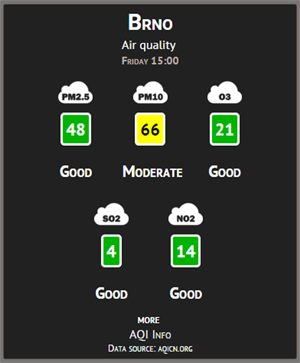 This block shows the current air quality. 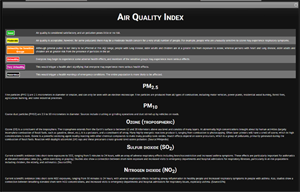 In particular it gives the air quality index (AQI) which is based on the concentration of the particular pollutant. 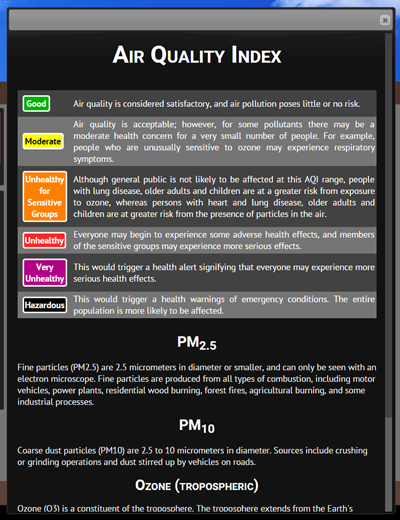 It gives information about PM2.5, PM10, ozone, SO2 and NO2 depending on data availability. In addition it shows past 5 days min/max. You can also view more information about what the current value means and there is also a general information about these pollutants and the individual limits. 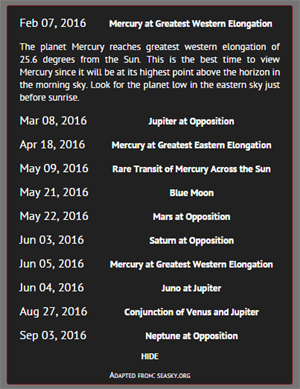 This is a collapsable block that shows interesting astronomy events such as planet elongations and oppositions, Blue Moons etc. Use this block if you have some audio files you want to play on your homepage. In the block settings you specify the file URL and the title for the block and users will be able to play this file directly from your homepage. 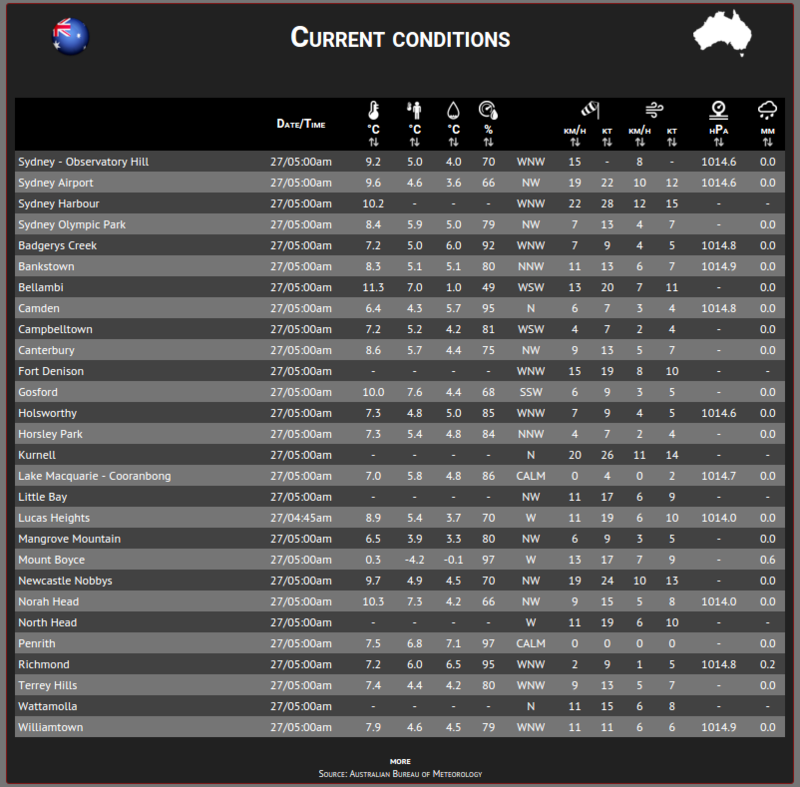 This block shows current conditions for major Australian cities, grouped by areas. First you choose which area you want to show by default and then in the default view you will see current temperature, humidity, pressure etc. for stations for which data is currently available. In the expanded view there are also the minimum and maximum temperature, times of measurement, maximum wind gust and others. Warnings for Australia - specify your region in the settings and the block will show if there are any warnings issued. Long-term forecast for cities from territory selected. 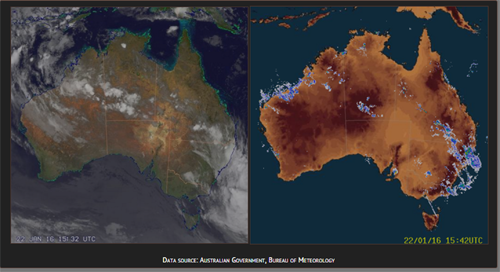 This block adds the national and regional radar images from Australia. 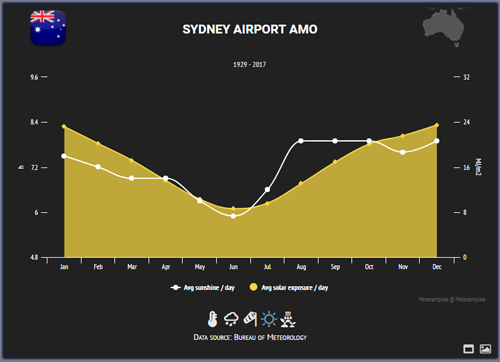 Choose a city and get detailed graphs of average monthly temperatures, precipitation, sunshine, evaporation, wind speed etc.. 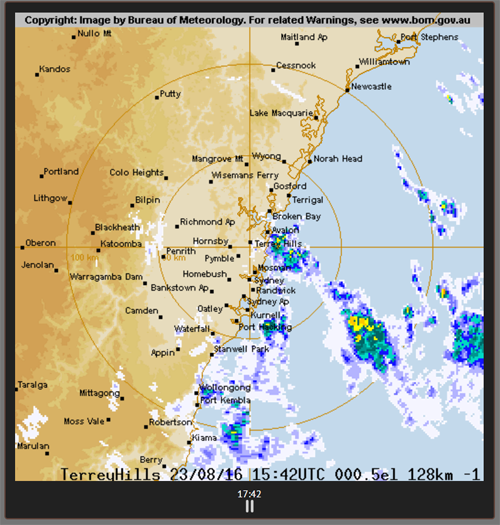 Regional animated radar image for Australia. 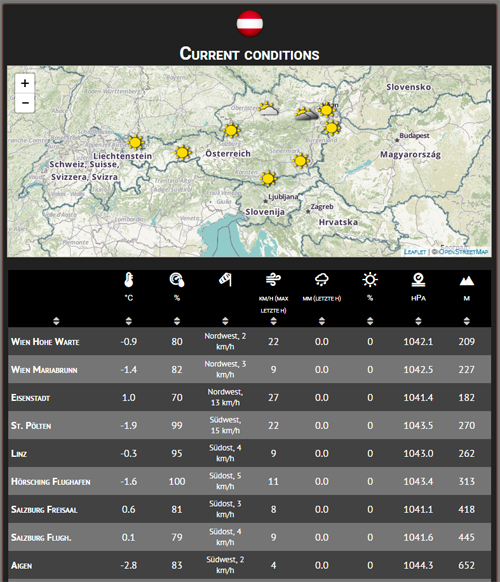 Block showing a map and a table with current conditions in major Austrian cities. 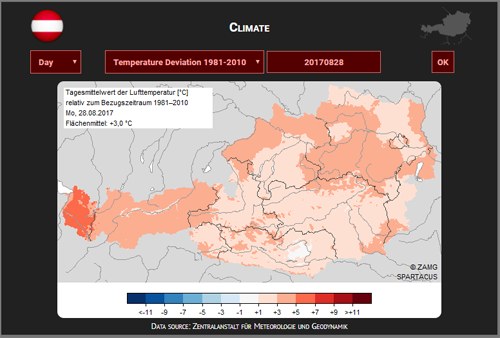 Daily, monthly and yearly climate maps. This block shows avalanche warnings from Tirol. This block shows the trend in pressure from the last 1, 3, 6, 12, 24, 48 hours, 3 days and one week. 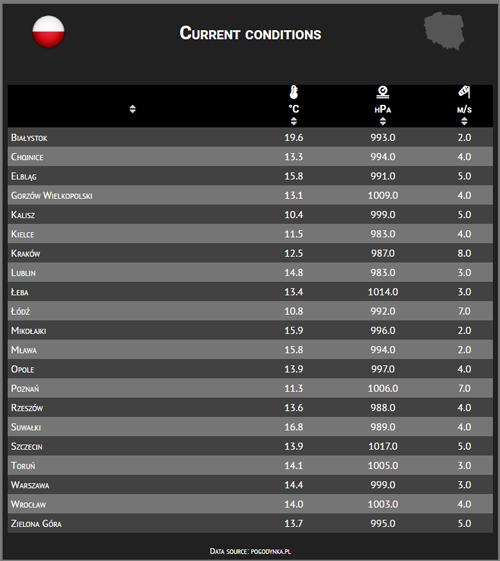 Block showing a table with current conditions for Belgium. Available in French and Dutch. 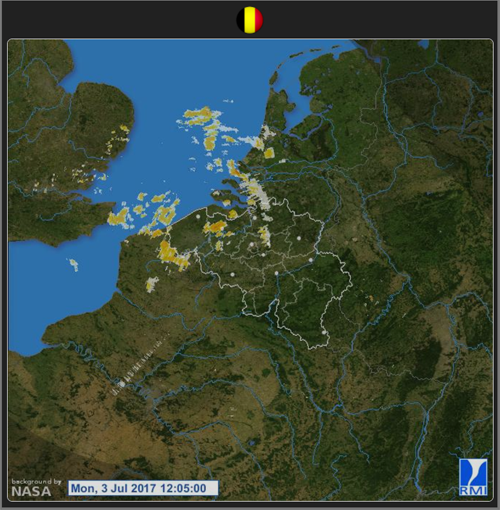 Animated radar image for Belgium. This is a blank block which you can use as a template if you want to create your own block. 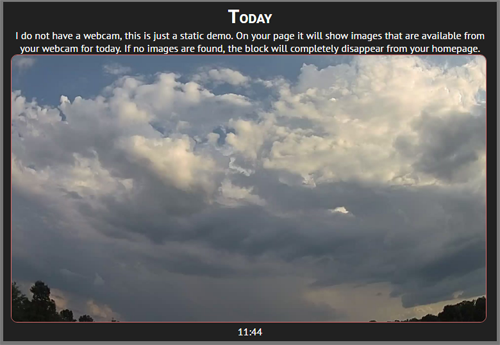 This block uses your Bloomsky API key and loads videos from previous days and shows them on the homepage. If no videos for the previous 5 days are found, the block will completely disappear from the homepage. See the screenshot, the DEMO does not work, I do not have a BS camera. Interactive map with Brazilian stations and their current conditions. 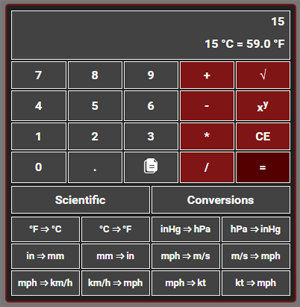 A simple calculator, which also has some additional weather-related functions for unit conversions. 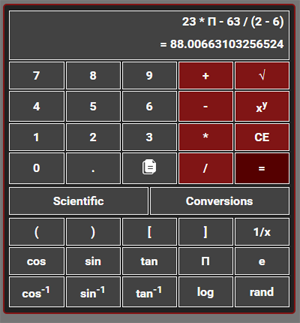 It can be expanded to show scientific functions as well and there is a possibility to directly copy the result to clipboard. This collapsable block shows the current day, month, year and day of the year. When expanded you will see the time remaining until next year and until the beginning of the upcoming seasons. 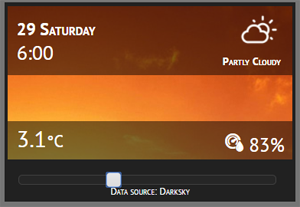 In the settings you can choose whether you want to use astronomical or meteorological seasons. 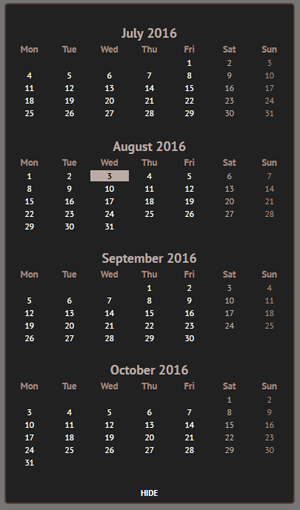 A simple calendar of the current month with today's date highlighted. In the settings you can also specify the number of previous and subsequent months to display. 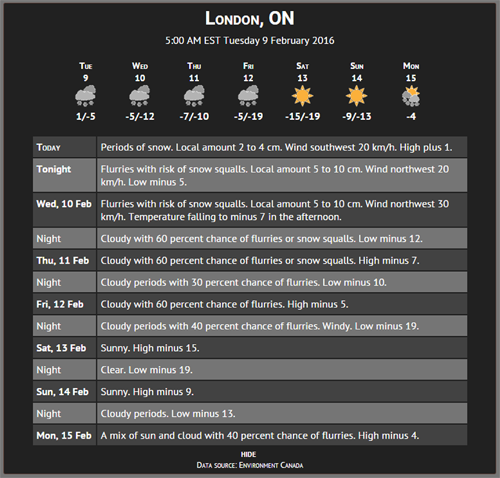 This block displays a 7-day forecast and detailed forecast from Environment Canada. 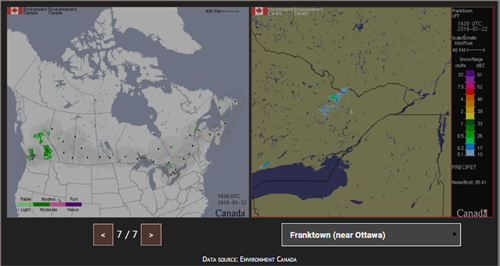 This block adds the national and regional radar images from Canada. You can choose the default regional radar and the user can then select any other one. 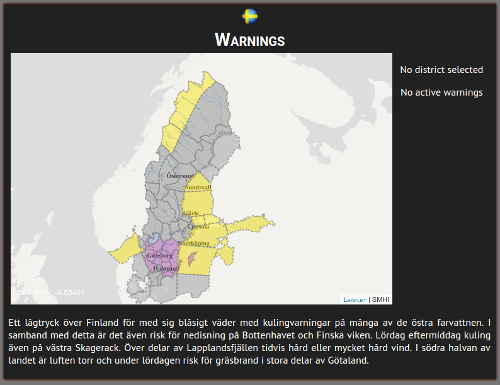 Specify your region in the settings and the block will show if there are any warnings issued. Supports both English and French. 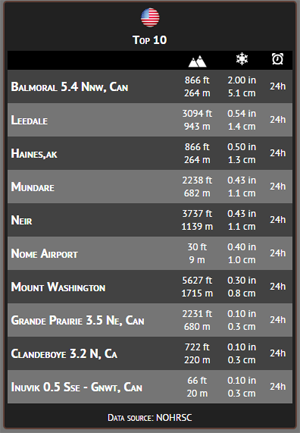 The highest and lowest temperature measured in the last hour in Canada. 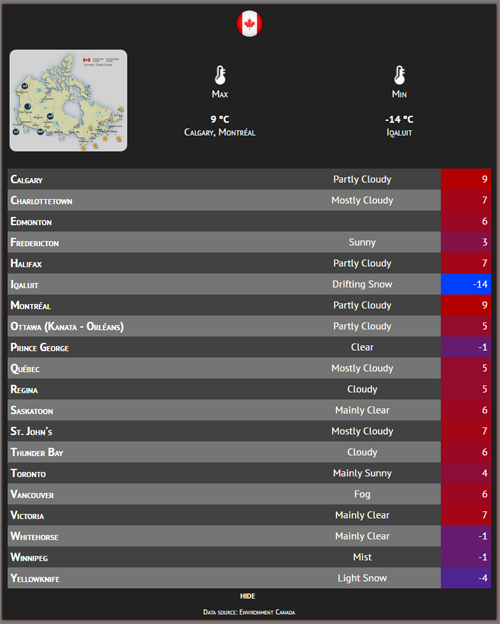 This block shows current conditions (weather conditions, temperature) in major Canadian cities. Available in English and French version. 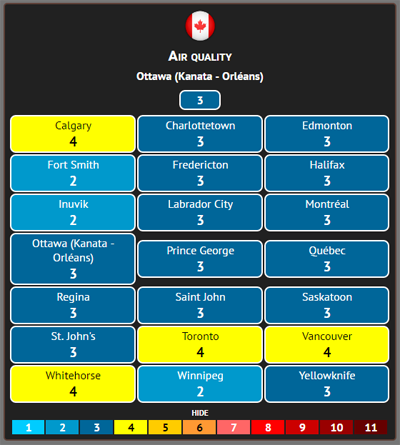 Air quality index for major Canadian cities - possibility to set default city as well as the block layout. 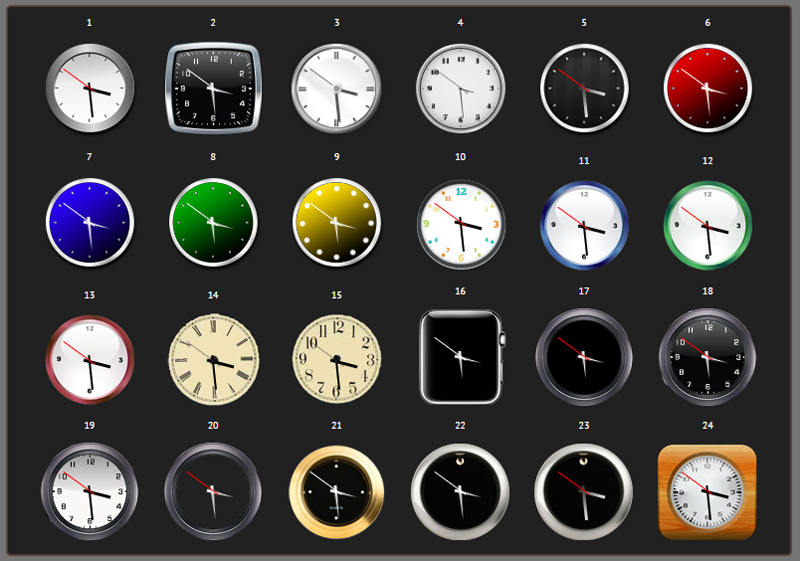 Analog clock with current time, you can choose from the designs you see on the next image. 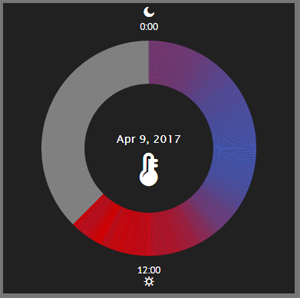 Digital clock with customizable color and style, optionally also showing current date and timezone offset, updating every second. 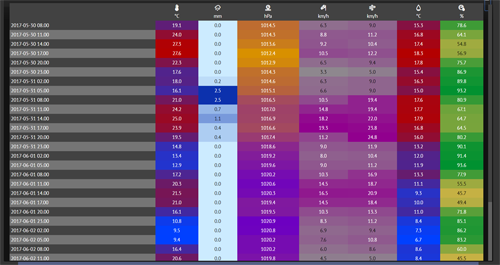 A simple block showing the estimated current cloud height in m and ft, based on the current temperature and humidity measured by your station. 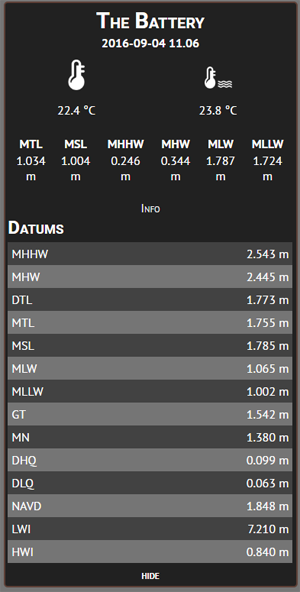 Values are shown for both height above the ground and height above sea level. 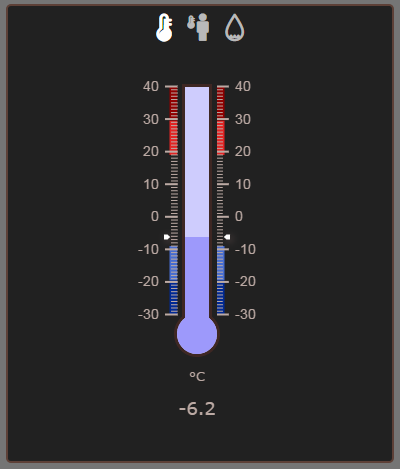 A simple block showing the estimated current cloud temperature in degrees C and F, based on the current temperature and humidity measured by your station. 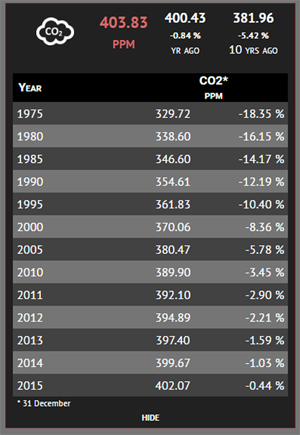 A block showing global CO2 levels measured at Mauna Loa. In addition to current levels, it also shows the value 1 and 10 years ago and a table of past values. In this block you specify a certain date and time and it will then show you a dynamically updated count down to this time. The counters automatically adjust to the block width. You can set unlimited number of counters. 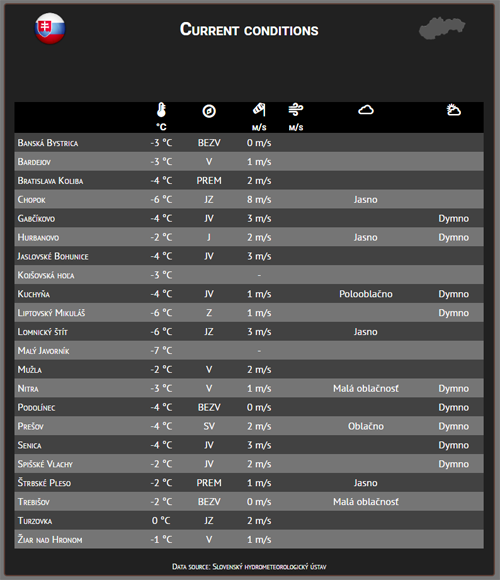 This block shows current weather conditions in major Croatian cities. 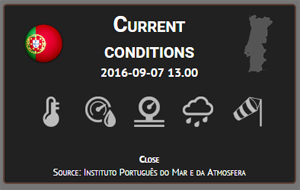 This is a block which shows current conditions reported by your station, updated in realtime. This block gets updates at much shorter intervals than what you have in your database. 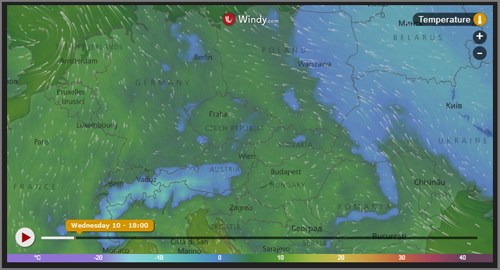 It is also possible to set how you want to display wind direction (degrees or arrow image). If your station is offline the block will show this and it is also possible to set warnings (warning symbol pulsating below a particular paramter - limits for warnings can be specified in the settings, as well as colors for these warnings). Also possible to show trends. 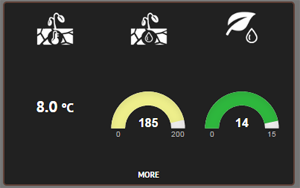 'More' section shows a detailed dashboard. In this block you select one parameter and it will dynamically update that parameter value. You can use this if you want to show one particular parameter in large font size. In the block settings you specify which parameter to show and the font-size. 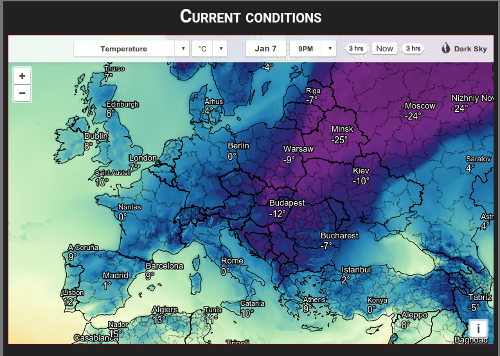 Interactive world map of current conditions (temperature, feels like, wind speed, gust, precipitation, dew point, UV etc.) as well as forecast and history maps in hourly steps. This block shows current conditions in major Czech cities. 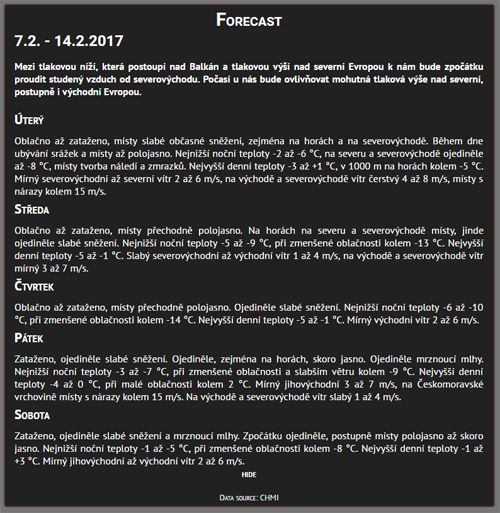 This block shows weekly textual forecast for the area of the Czech Repblic. This block shows an animated radar for the Czech Republic. 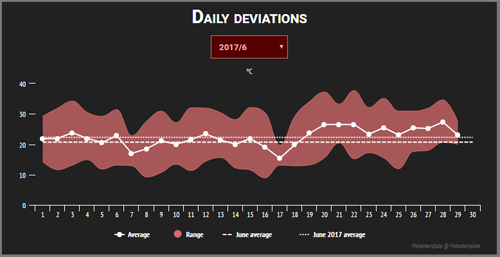 Comapre daily deviations with selected month's average and normal. This block will show you the time and time left until the next sunrise/sunset depending on the time of the day - in the early morning it will show the upcoming sunrise, during the day sunset and after sunset it will show the time and time remaining until the sunrise the next day. 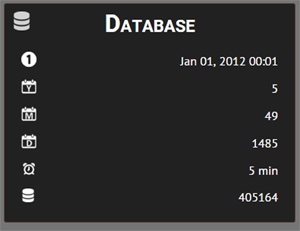 This block shows a summary of your database - date and time of first record, number of years, months, days in the database and the logged parameters. 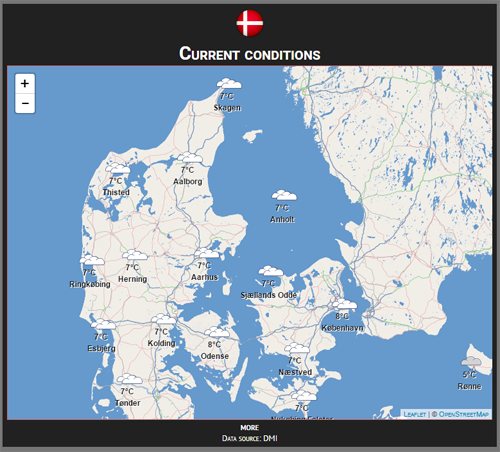 Map and table with current conditions in Denmark. 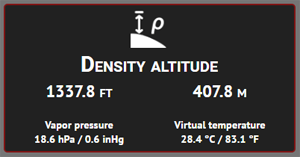 This block calculates density altitude and also vapor pressure and virtual temperature, something useful especially for those interested in aviation. 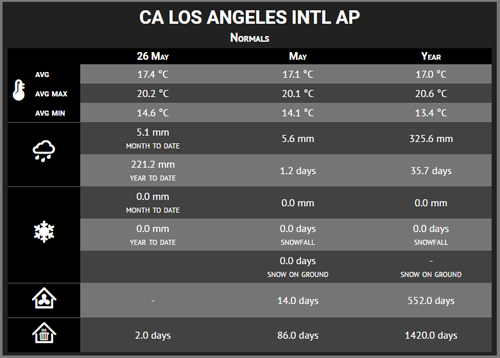 In this block you provide long-term averages or normals for monthly temperature and precipitation and the block will calculate monthly deviations. This block takes advantage of the existing language files and allows you to insert a dictionary on your website. You can choose the two languages you want to translate (to and from) and it also has an option of dynamically updating the randomly selected term. Make sure you update your language files on a regular basis. Choose a parameter, update interval and this graph will update in realtime. 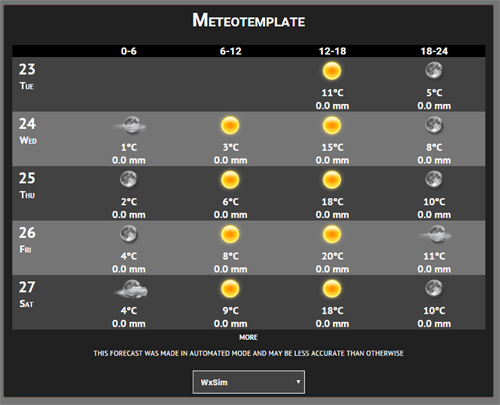 Requires Meteotemplate 12.0 or higher. In this block you can specify URLs for images you want to display and for each you specify also the update interval. These images will then show in the block and update in the specified interval without entire page refresh. Each image can have different update interval. This block allows you to specify triggers, which when activated will show a particular text. 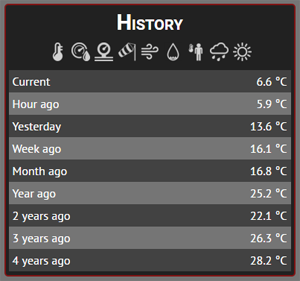 For example you can set triggers based on temperature, humidity, etc., but also sunrise, sunset, time of the day, particular day in a year, specific date etc. For each message you can also supply an icon and if no there are no messages to display at all, the block will completely disappear. 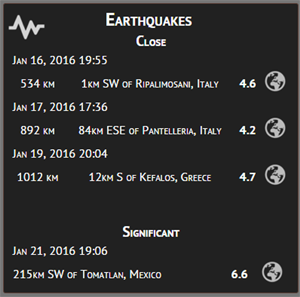 This block shows you the latest earthquakes. It is divided into two sections. The first section shows all the earthquakes in certain radius around your station. You can set this radius in the block settings. 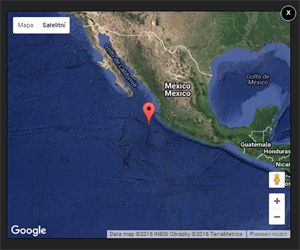 The next section then shows the most significant recent earthquakes for the whole Earth. You can also specify how many you want to show. There is also an icon of the globe, which when clicked, will show you google map with a marker where that particular earthquake occured. 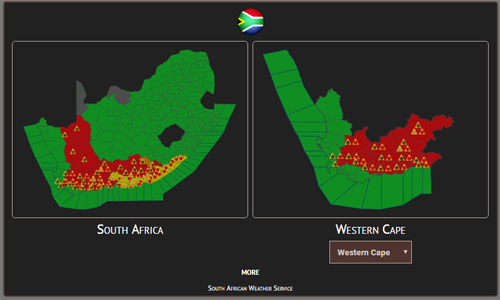 Interactive map displayed in a popup when the icon next to each earthquake is clicked, showing the exact position. 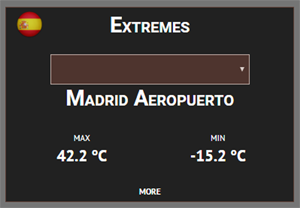 Display weather station extremes. You can choose the particular parameter, grouping and number of items to show. 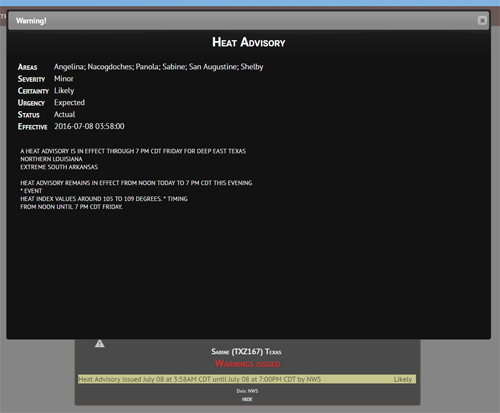 Specify your country in the settings and the block will show if there are any warnings issued. 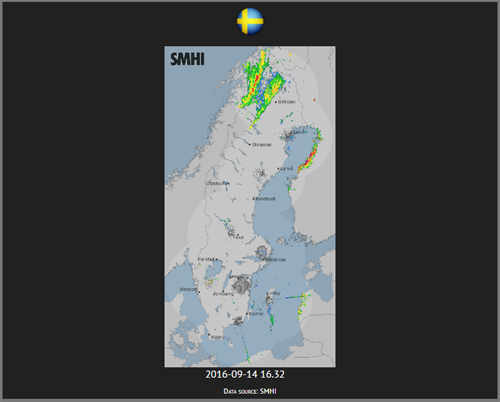 This block adds the national and regional radar images from Europe. Specify your region in the settings and the block will show if there are any warnings issued. 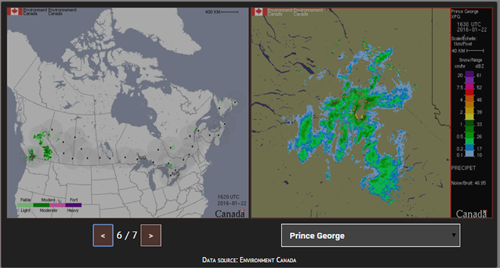 Animated zoomable radar image for Findland (regional). 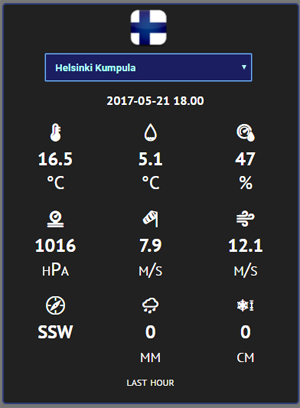 Current conditions for cities around Finland. 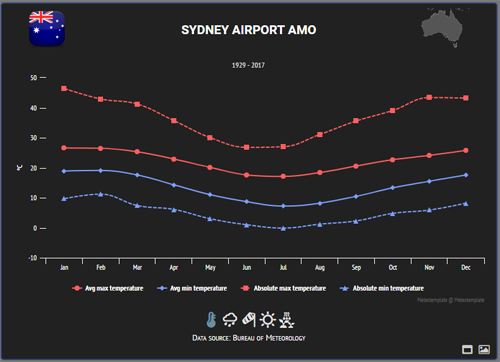 Temperature and precipitation statistics compared to normal from 1961 to 2016/2017. 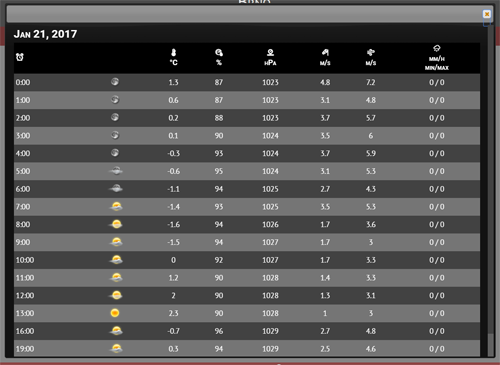 This block shows the current fire danger index based on current weather station conditions. 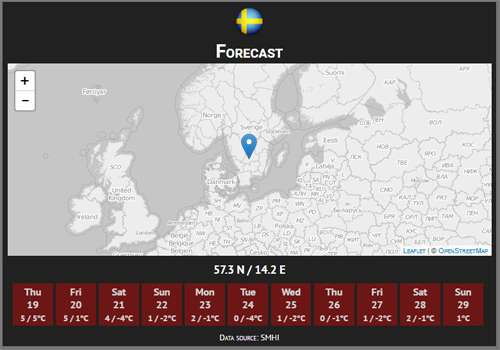 This is a block which shows the forecast for the location you specify in the settings. 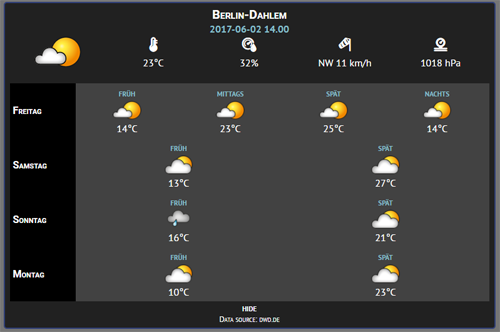 There is a select box, which allows the user to switch between various forecast providers. I hope to add aditional providers in the future, currently the following are available: Yahoo Weather, Yr.no, DarkSky.net, WxSim and Weather Underground. All data is cached for fast loading and not exceeding your free API daily limit of calls. 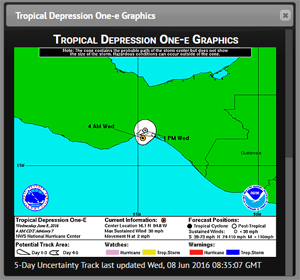 This block shows a 48h forecast as an interactive image with a slider to slide through days. The background will reflect the forecasted condition and show for example animated rain, lightning (when thunderstorm is forecasted), falling snow, sun, sunrise, sunset, fog etc. 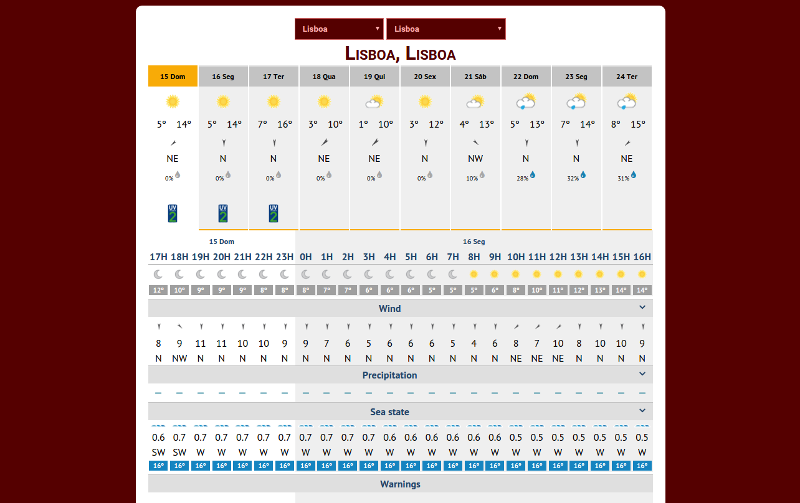 In addition you can also see the forecasted conditions (temperature, humidity, pressure, wind speed, dew point). It is a little bit like the interactive banner, but it uses much less CPU power and of course there is no Flash or similar technologies used. 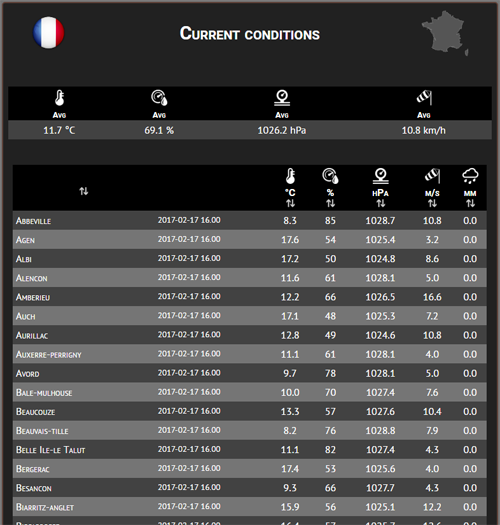 Current conditions from cities in France. 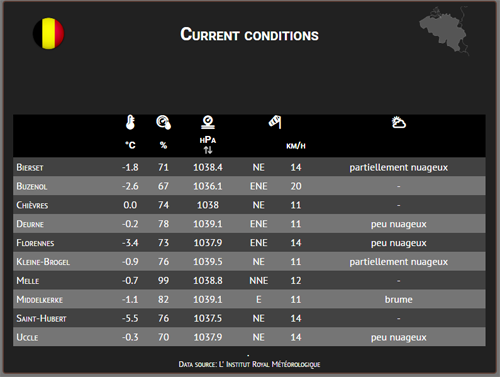 This block shows maps of current conditions for various parameters for French regions and France as a whole. The image automatically updates. 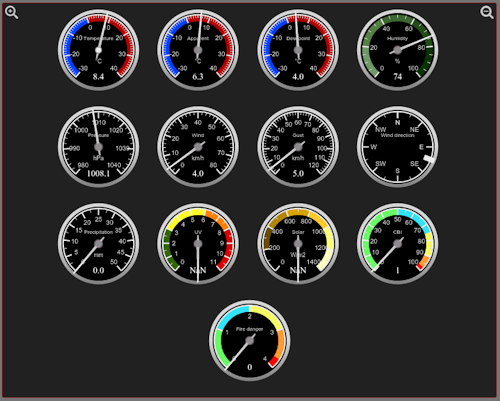 Highly customizable, auto-updating, responsive, interactive gauges. 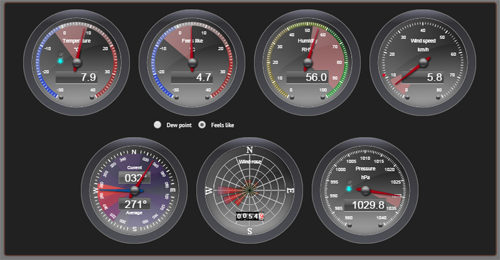 Select which gauges you want, styling, show values, titles, 3D effects, shadows and much more. 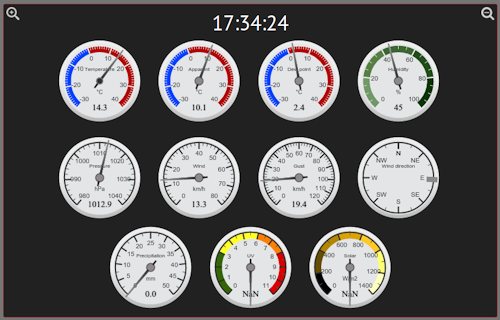 A more robust version of the gauges. 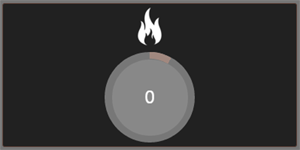 This block REQUIRES the SteelSeries plugin and uses the settings you specified for this plugin. It is however optimized for viewing as a block, you can specify different gauge size and there is no summary page or graphs. Other than that it supports all the features of the SteelSeries plugin (localization, design, other customizations etc.). 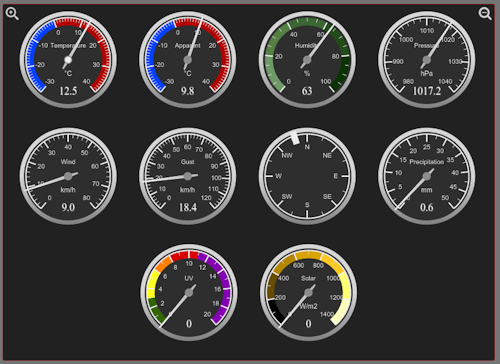 It also uses all the plugin settings for the updates and paths so you only have to set the gauge size and you are ready. 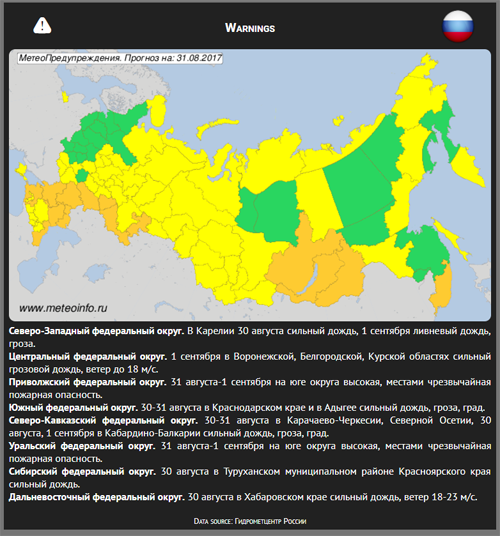 National and regional maps with current conditions and warnings. 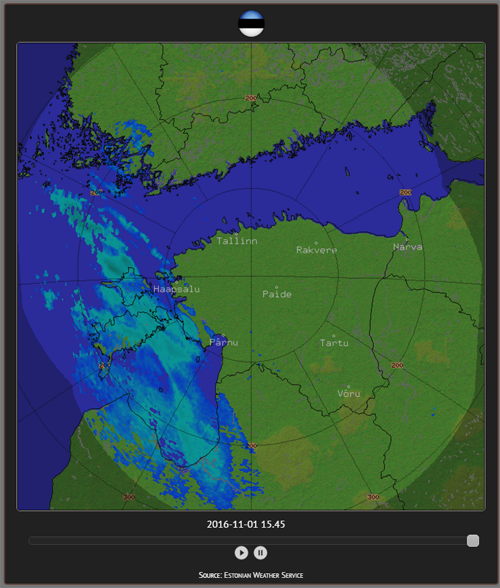 Animated radar images for Germany as a whole and the individual states. 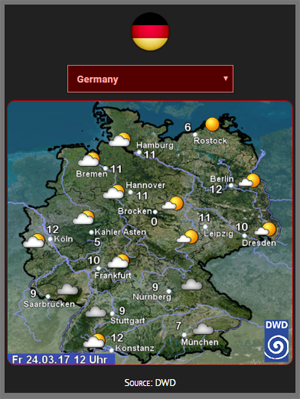 Current conditions and weather forecast for selected city using data from DWD. 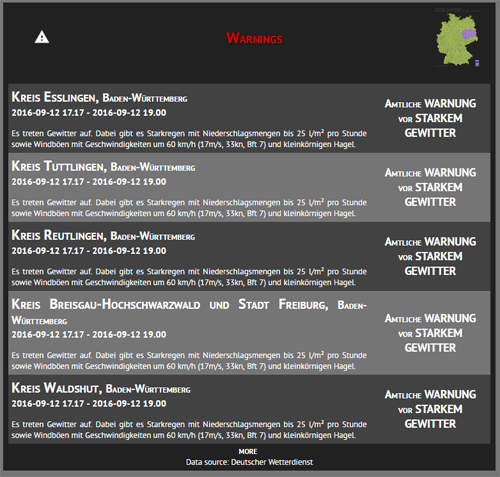 This block shows regional warnings for Germany. The warnings for the default state you select in the settings are displayed directly, other states are displayed when you click the 'more' link. There is also a zoomable map included. 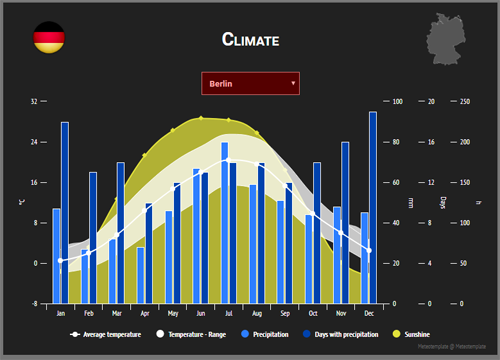 Climate graphs for German cities. A relatively complex block for the GFS (Global Forecast System) model. 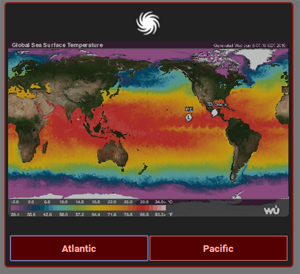 It shows many graphs, tables and maps for regions all around the Northern hemisphere. This includes temperature, wind speed, precipitation, dew point, humidity, snow depth, CAPE and much more. Graphs show both averages and all the ensembles from the latest GFS run. 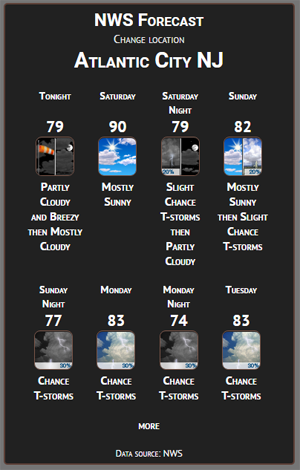 The model forecasts for the upcoming 16 days. 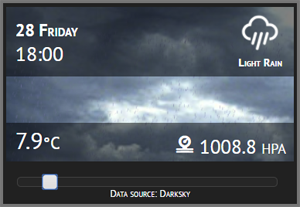 This block shows a randomly selected weather related term and the user can then click to show the definition of it or generate a new random term. 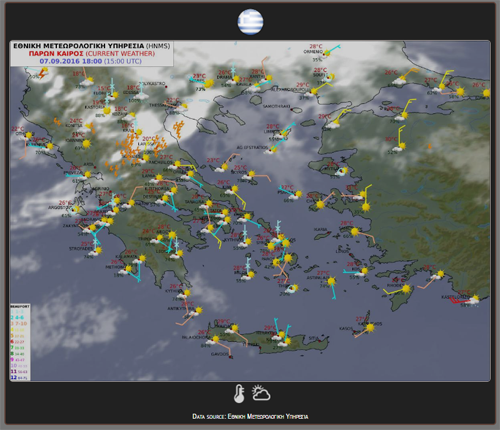 This block shows map of conditions in Greece and map of max/min temperatures for the current day. 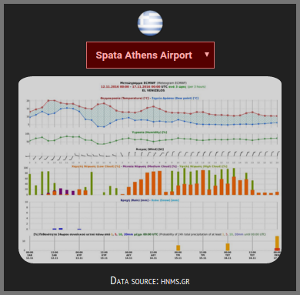 This block shows detailed zoomable meteograms for all major Greek cities. 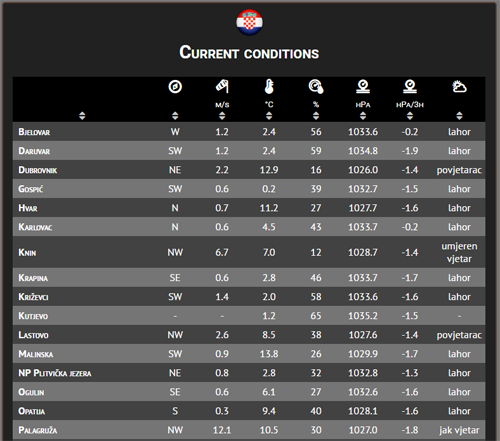 Current conditions in cities in selected region. 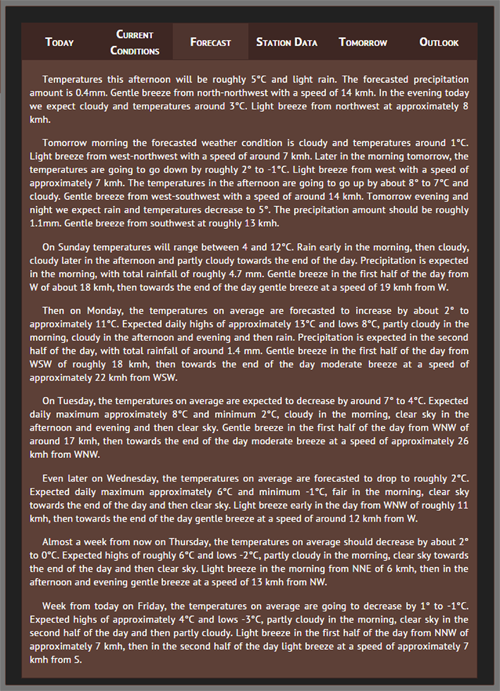 Detailed marine textual forecast (only available in Greek). 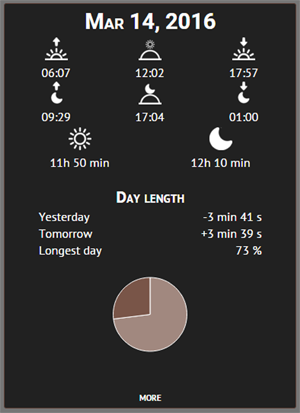 A simple block where you define various text strings to be displayed depending on the time of the day. This can be used for example to say Good morning, good evening etc. In the settings you just set as many intervals as you like and the default text and it is also possible to set particular color for each interval. This block shows the conditions that were exactly an hour ago, day ago, week ago, month ago etc. for the various parameters. 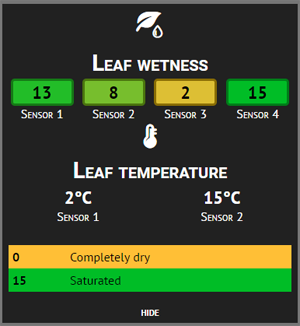 This block uses the current conditions API file to show humidity data from extra sensors. Only use this block if you have some extra humidity sensors data sent to the API. Please note - since I do not have any of these, the DEMO is static, only for demonstration purposes. 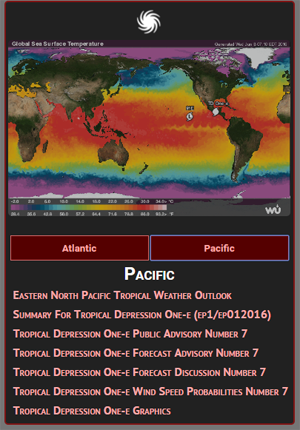 An RSS feed for hurricane-related news for Atlantic, Indian Ocean and Western and Eastern Pacific. There is also a map and details for each report can be viewed directly from the page. Data is being cached from NOAA. This block shows a random image, which can be zoomed to full size. The image is selected randomly from the 'images' directory of this block. There is also a page for you as an admin, from which you can delete/upload images directly using your admin password. Instructions how to use this block are in the 'settings.php'. This block can show your indoor temperature and humidity. 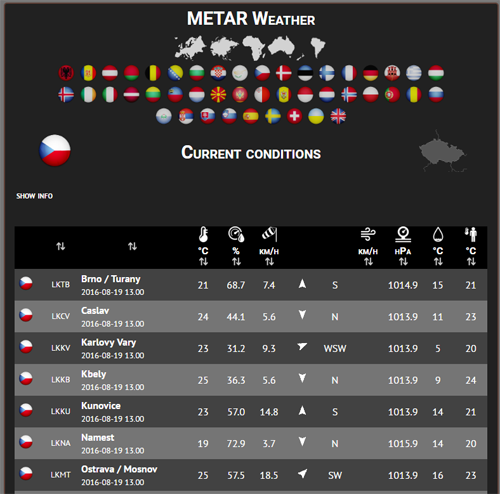 This is just a static block which shows information about your weather station model, software used and Meteotemplate. This block is pretty much a condensed version of your interactive graphs. 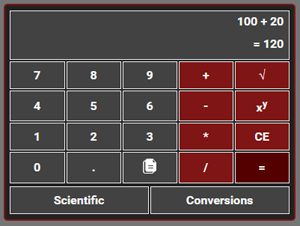 It allows the user to select the parameter, grouping and interval. 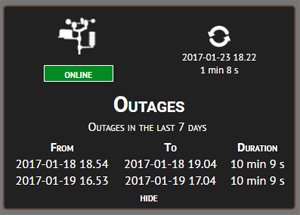 The graphs are updated directly in the block, without the need to refresh the page. 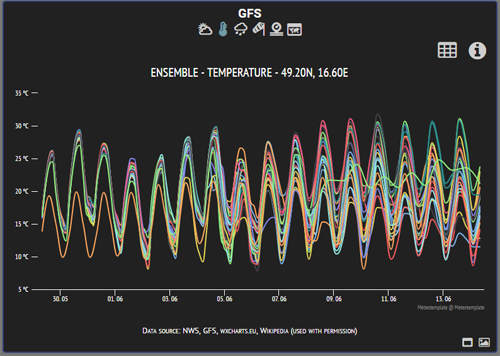 It is also possible to set colors of the graphs (versions 3.0+). A block for showing climate for Italian regions. 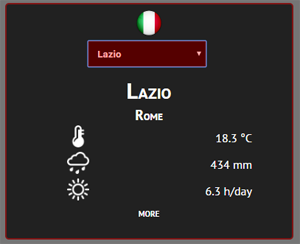 A block for showing current conditions for Italian cities. 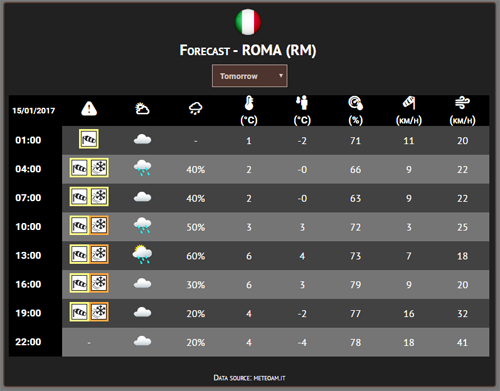 Forecast for Italian cities and national forecast. Zoomable radar for the region of Italy. Zoomable national and regional radar for the region of Japan. Choose languages and allow the user to switch site language directly from homepage. 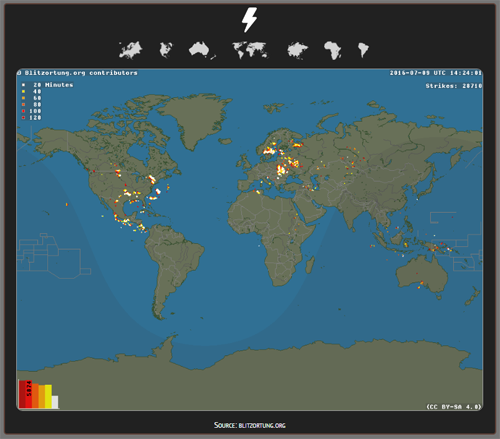 This block shows a map with current lightning strikes, grouped by continents or for the entire world. 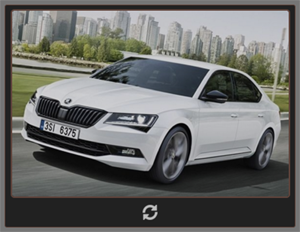 The image auto-updates at the interval you specify in the block settings. 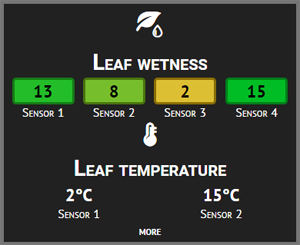 This block shows leaf wetness and leaf temperature for up to 4 sensors. 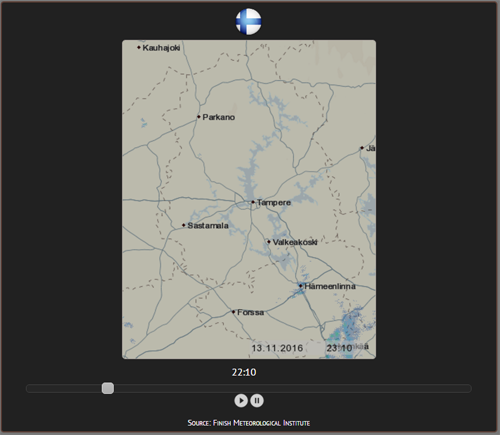 This block shows your station latitude, longitude and elevation, along with a link to a popup with an interactive map showing your station position. In the settings you can define the default zoom and map type. 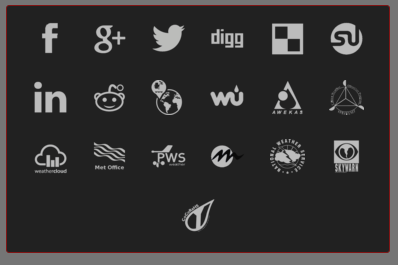 A simple block to display a logo of your site. If you have one, you just specify the path to it and select if you also want to show borders and its size. 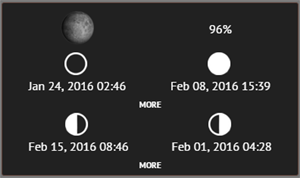 This block shows the upcoming lunar eclipses. In the collapsed state you just see the next one coming. Expanding it will reveal more upcoming ones. This block shows an interactive map, centerd at your station. 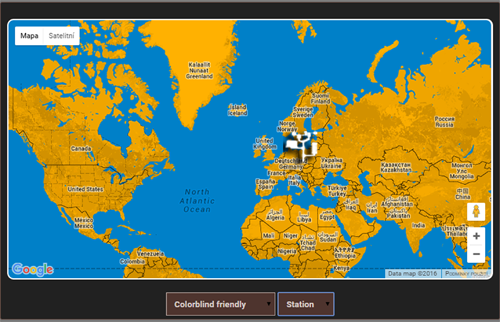 The user can select map style (over 35 available) as well as the marker type and the map can be moved around, zoomed etc. 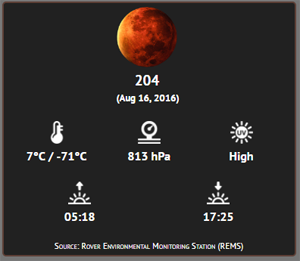 This block shows current temperature, pressure and UV for the planet Mars. 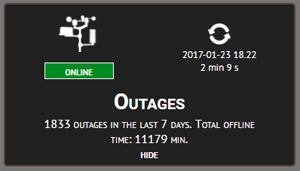 Data updated once a day (usually :-). 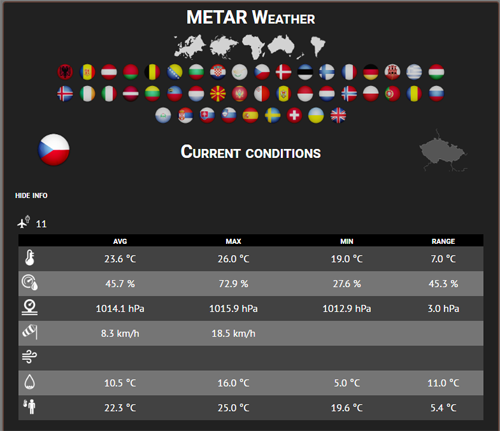 This block shows current conditions along with a summary for that country for all available METAR stations. Data is automatically cached and converted to units specified for the template. In this block you provide a valid METAR code and the block will show you the most recent data from this airport, both in decoded and the original raw format. 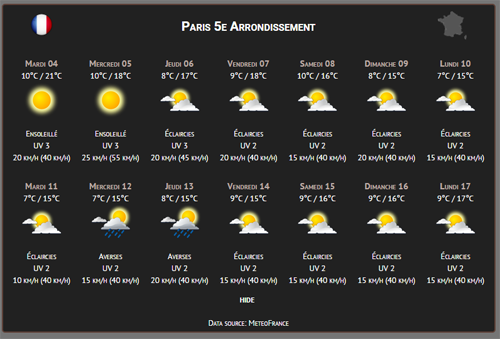 This block shows 48h forecast using a meteogram and data from yr.no. 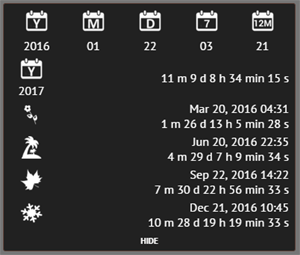 Block with the upcoming meteor shower and when expanded, shows the list of meteor showers for the next 12 months. 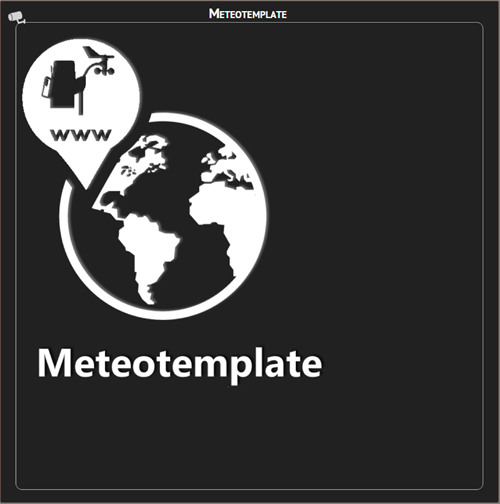 Get the latest updates from the Meteotemplate Blog.  This way you will stay up-to-date with regards to updates and new features. View the current Moon phase and the upcoming date of Full Moon, New Moon, First and Last quarter. In addition, when expanded will show the upcoming dates for the subsequent months. 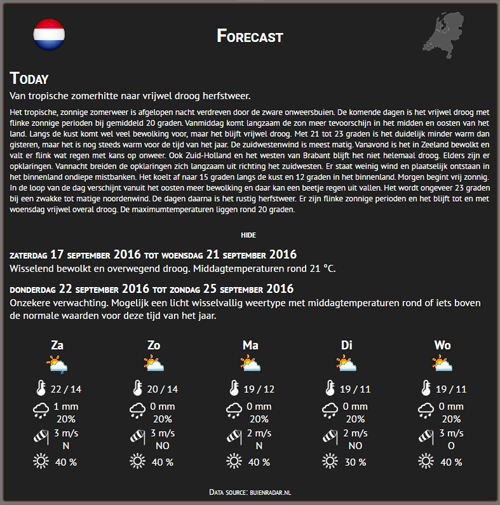 In this block you can create your own forecast! Specify temperature, precipitation, etc., choose icons, issue warnings... it is all up to you. 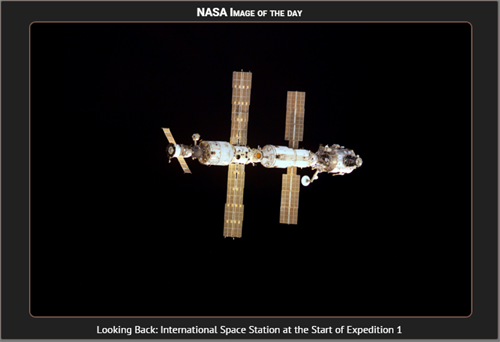 This block will show an image from the NASA images of the day gallery. You can specify if you want to show always just the most recent one, or choose one randomly from the approximately 30 available in the past. 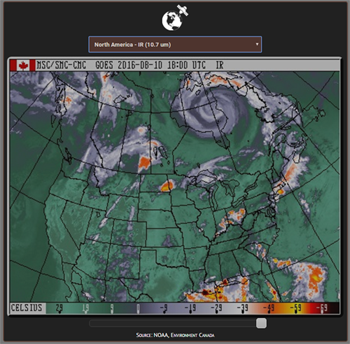 This block includes close to 50 different satellite images from several Earth-orbiting satellites covering the area of North America, primarily Canada. 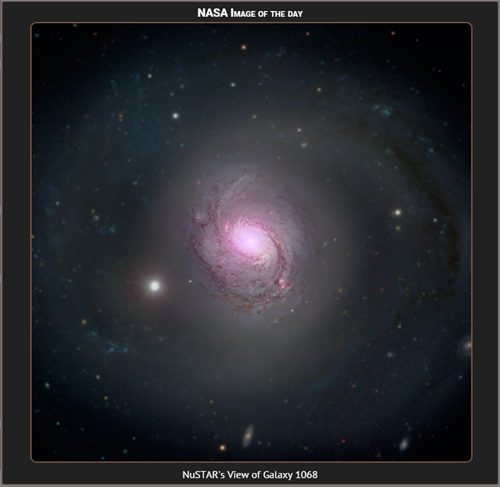 Images can be selected by the user and zoomed in. 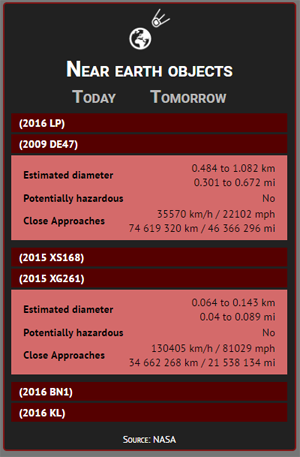 A block showing near Earth objects for today and tomorrow, with additional information such as object size, speed and distance. 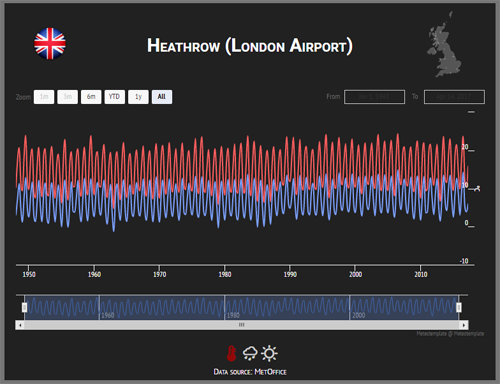 This block shows real-time data from the noise and CO2 sensor of the main unit. You need the NetAtmo plugin installed, version 2.0+. 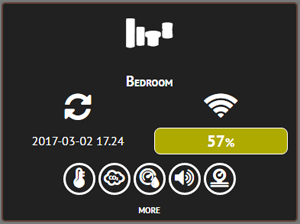 This block shows information about your NetAtmo connected modules - battery level, signal strenght, last update etc. You need the NetAtmo plugin installed, version 2.0+. 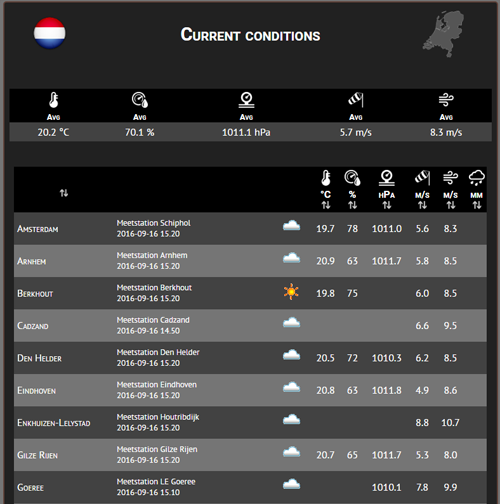 A block showing current weather conditions for many places in the Netherlands. 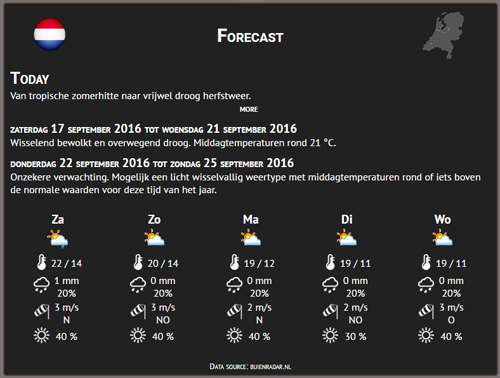 Textual forecast for the Netherlands in Dutch from KNMI and BuienRadar. 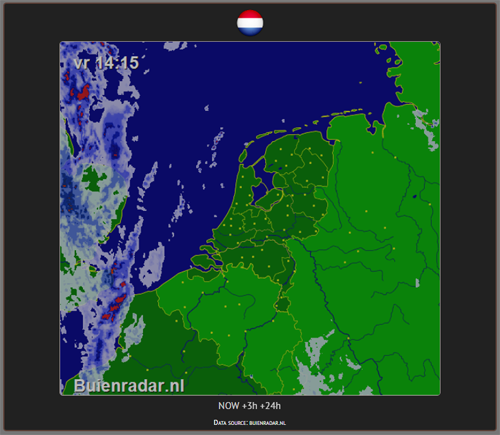 Animated radar image for the Netherlands, current and +3/+24 hours. 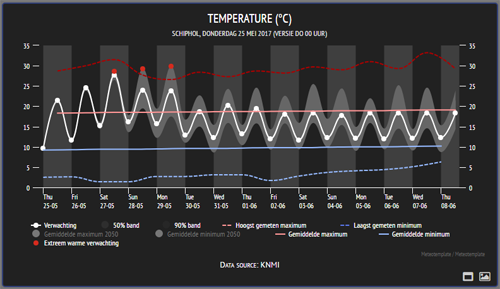 A block showing temperature normals for several locations in the Netherlands. 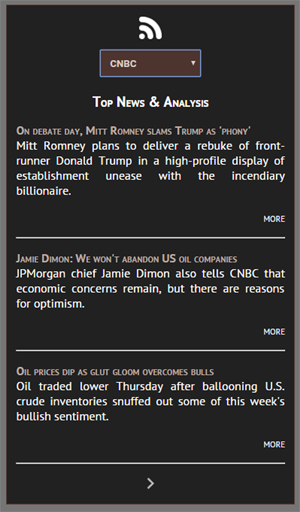 This block is a sliding news feed. On a separate page you can insert/delete items and this is then displayed on the homepage. It cannot be seen on the screenshot, but once there is more items, they will animate and slide down. You can use the settings to set if you want to autoplay on load or stop on mouse over etc. Instructions how to use are given in the settings. 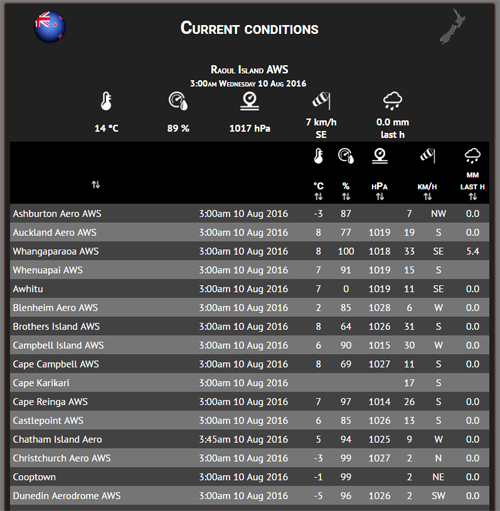 This block shows current conditions for many different places in the New Zealand. You can specify your default location which shows right at the top. The table is sortable and data refreshed hourly. 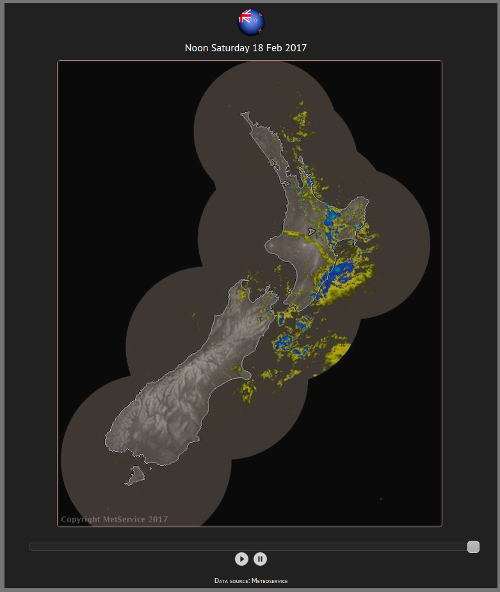 Forecast for cities around New Zealand. 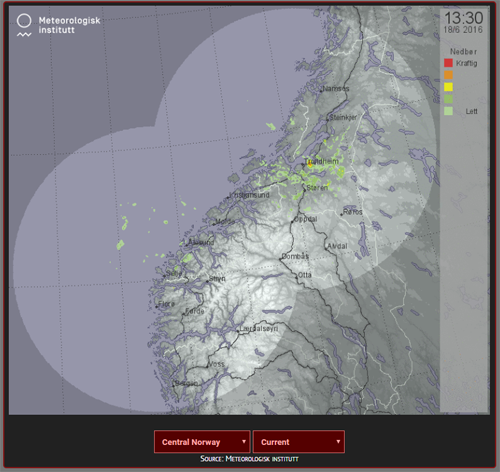 Regional localized Norwegian weather alerts. 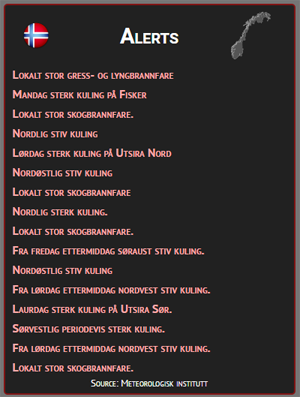 This block is a fully localized regional forecast for Norway. 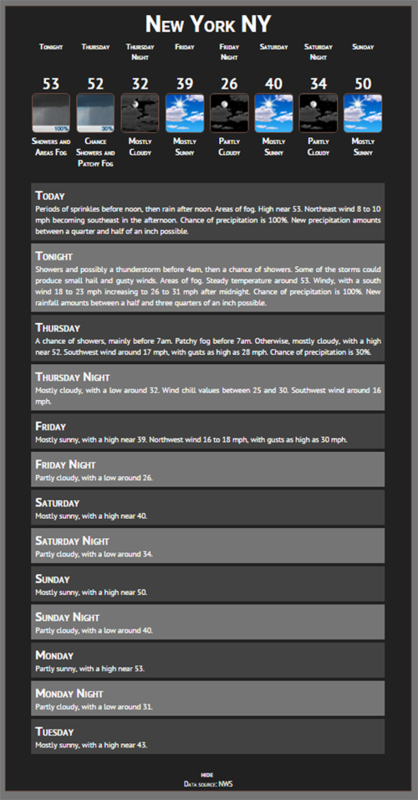 Weather outlook for the upcoming 24 hours. 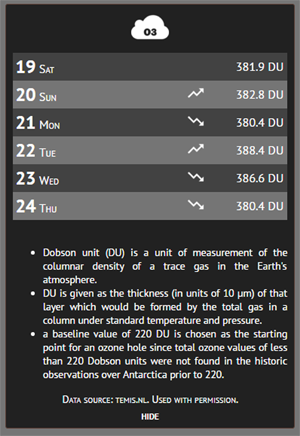 This block shows ozone forecast based on satellite data for your location. 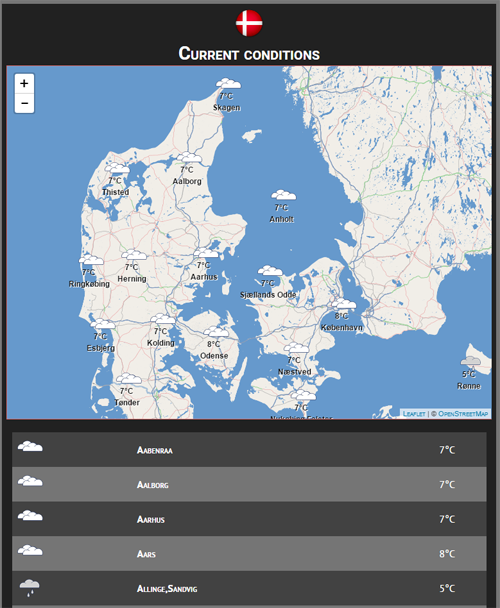 This block now allows you to put conditions and link to weather stations of your friends etc. The only condition is they have their data sent to WU. In the settings, you specify their WU ID. Very simple block, which will add the PayPal donate button/icon to your site, based on your settings in main setup. This block shows day values as a color pie chart. 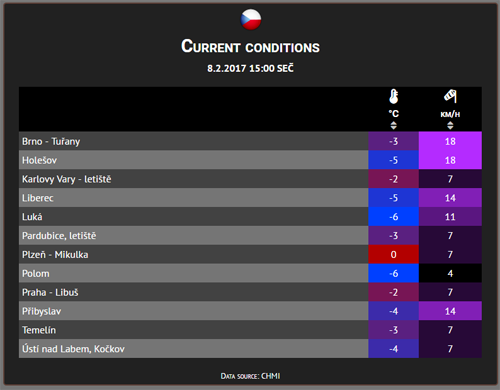 Block which shows current conditions (temperature, pressure, and wind speed) for Polish cities. This block allows you to create a poll. First you specify a question and the possible answers. 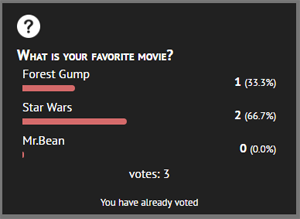 Then users can vote and display the results. A mechanism also checks your IP so one user can only vote once. In the block setup you can also reset votes or delete and create a new poll. 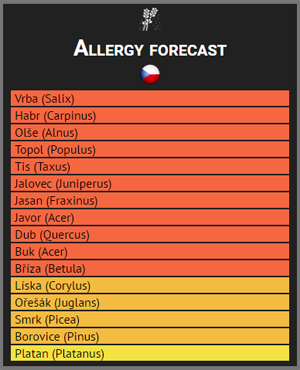 Pollen forecast block shows current potential allergens. Supported countries: Czech Republic, Austria, Germany, Switzerland, Canada. 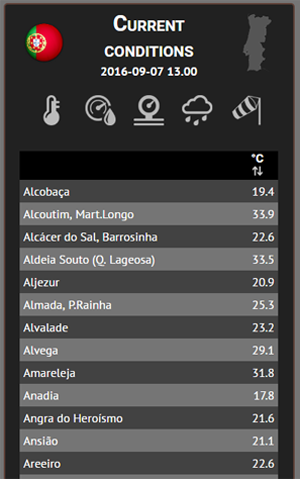 Block which shows current conditions (temperature, humidity, pressure, precipitation and wind speed) for Portuguese stations. 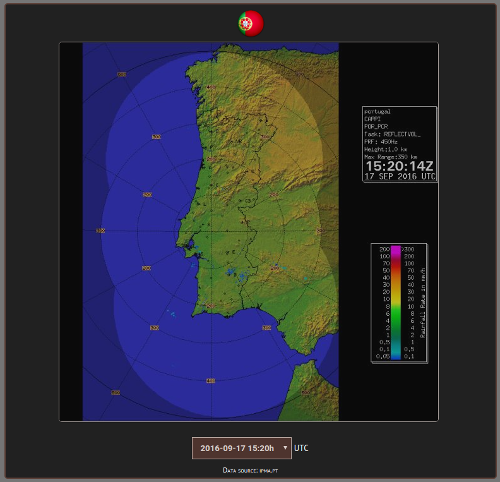 Block which shows detailed hourly/daily forecast for most cities in Portugal. 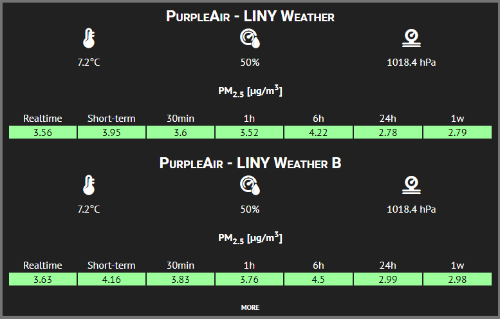 Display data about PM2.5 concentrations from your PurpleAir station. 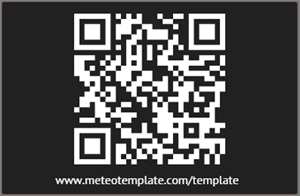 This block will add a QR code, which encodes the URL of your Meteotemplate site. 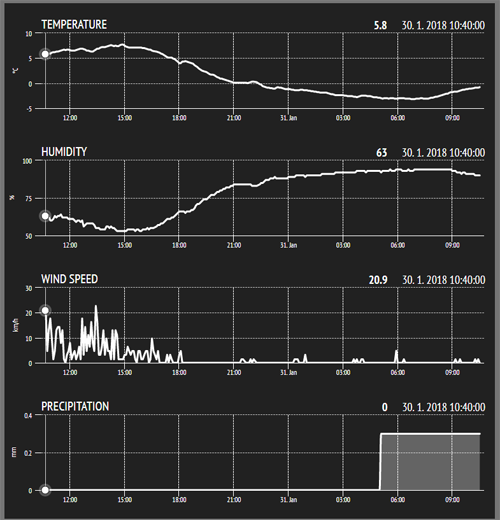 A simple block showing precipitation summary. 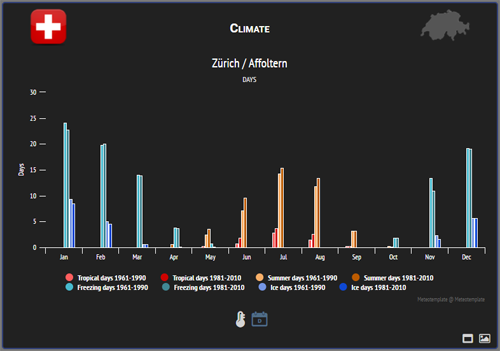 This block shows precipitation against normal values in recent days/months. This block shows today's time of Sun rise, Sun set, Moon rise, Moon set and also the times of transits and day length and night length. 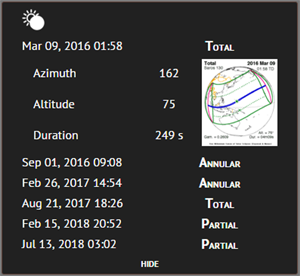 In addition, in the collapsed view you can see the differences in the length of the day and a pie chart of today's length of the day in comaprison to the longest day of the year, twilight pie chart, a summary table and visualization of station latitude. 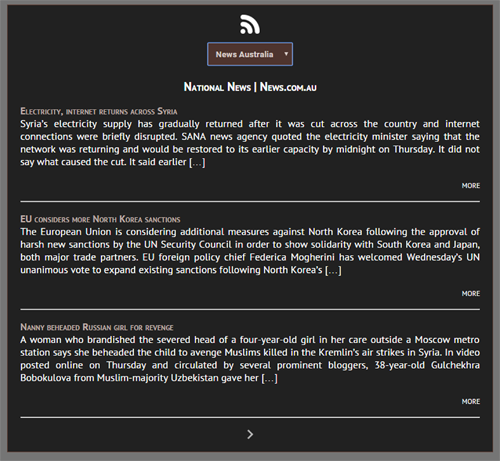 In this block you can specify as many RSS feeds as you like and it will display them (assuming they confirm to the proper RSS format). Additionally, the items are automatically sliced into pages and you can specify the maximum number of items per page and you can also limit the length of the text for one item, which means if it is longer, it will be truncated at the nearest word, but making sure any HTML tags are preserved. Also supports pictures. 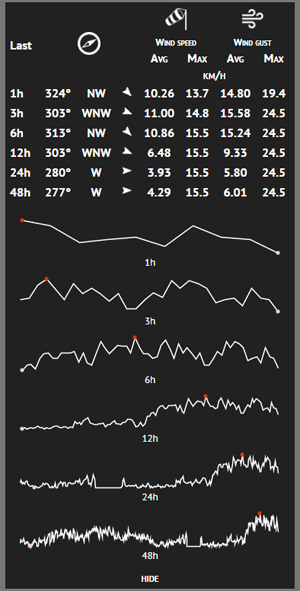 This block shows current sea temperature in location of interest as well as monthly avg/min/max. 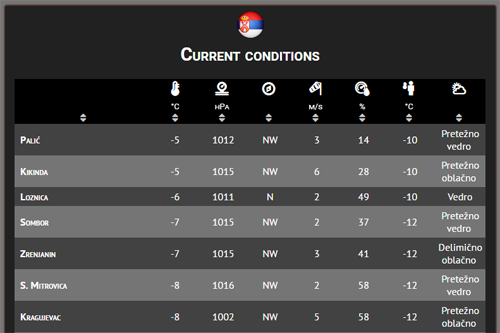 This block shows current conditions (weather conditions, temperature) in major Serbian cities. 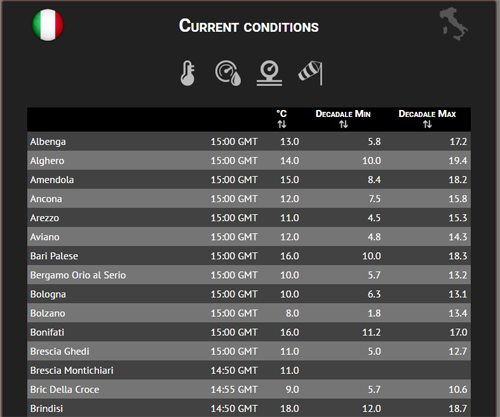 This block shows current conditions (weather conditions, temperature etc.) in major Slovakian cities. 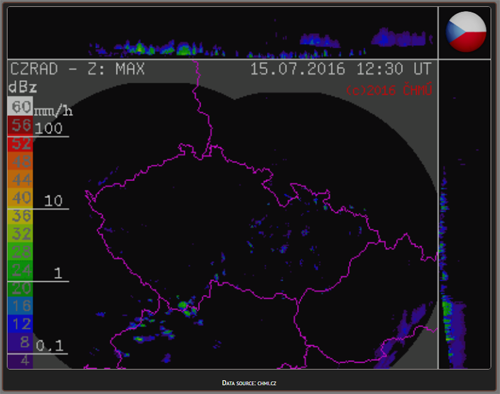 Animated radar image for Slovakia. This block uses information you enter via the Snow plugin. This will therefore only work if you have the snow plugin installed and you enter data with regards to the amount of snowfall and snow depth! This block automatically shows links for sharing your website at popular sites such as Facebook, Twitter, Google+, LinkedIn, StumbleUpon, Reddit, Instagram etc. 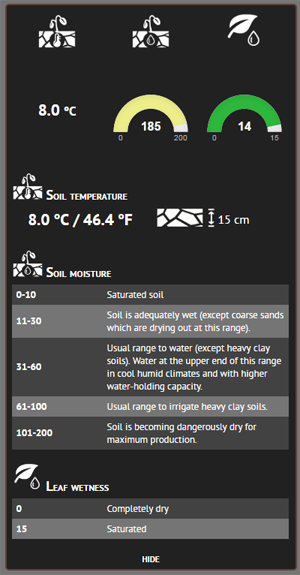 This block is for users who have a sensor that measures soil temperature, soil moisture or leaf wetness. 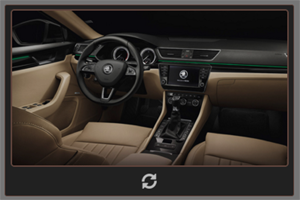 You can choose which of those three sensors you want to enable. 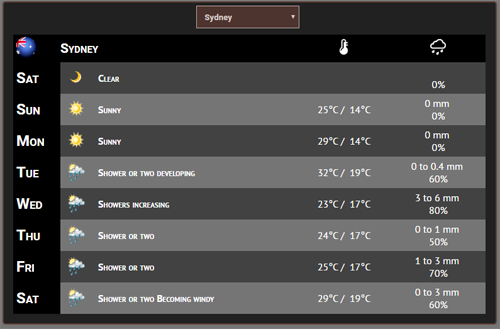 Currently supports Weather Display, Cumulus and WeatherCat. Block which in its collapsed state shows the upcoming solar eclipse, when expanded, will show more information as well as the other upcoming eclipses. 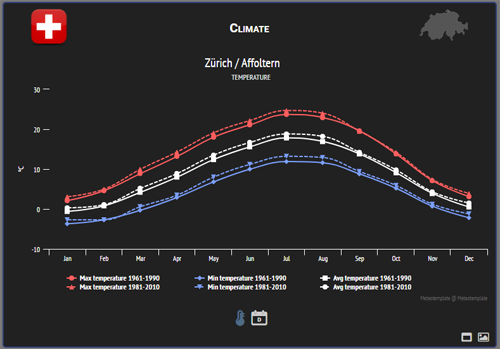 Climate in selected cities in Switzerland. 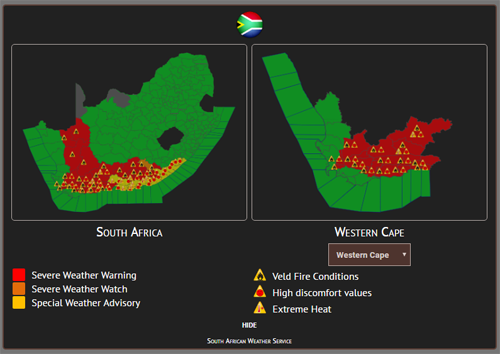 National and regional warnings for South Africa. 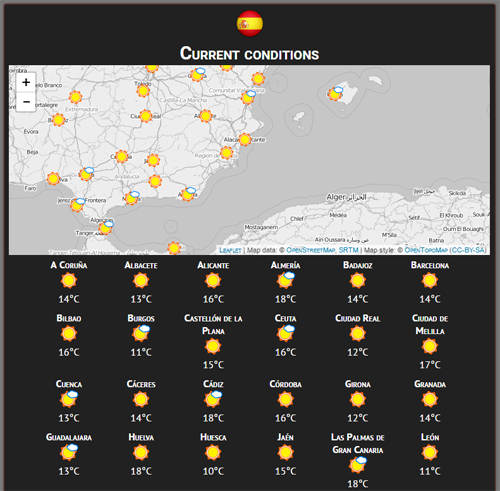 This block shows a map and a table with current conditions and temperature for major Spanish cities. 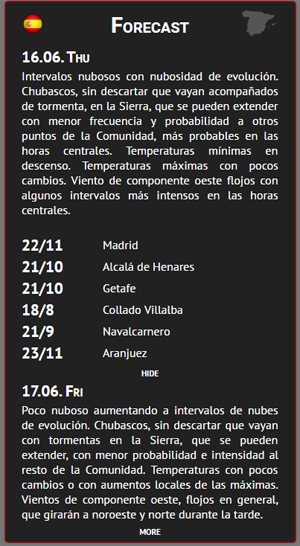 This block shows weather extremes for main Spanish cities/stations. 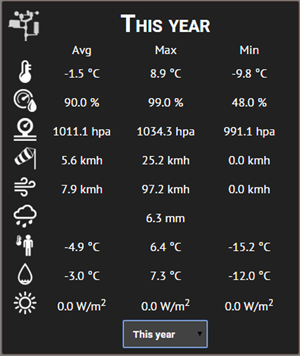 This includes absolute max/min temperature, monthly max/min precipitation, wind gust, days with snow, days with storm etc. 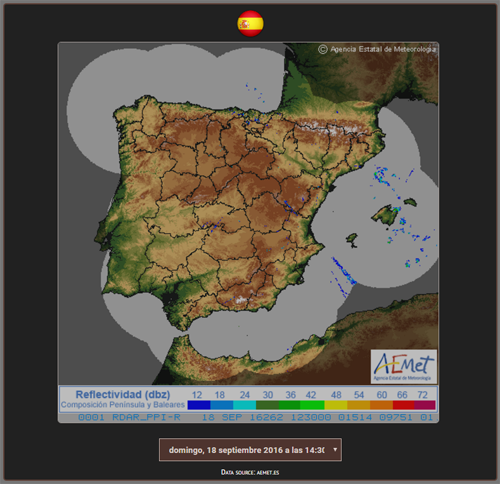 This block is a fully localized regional forecast for Spanish provinces. 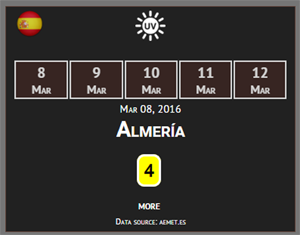 This block shows UV forecast for the upcoming 5 days for major Spanish cities. 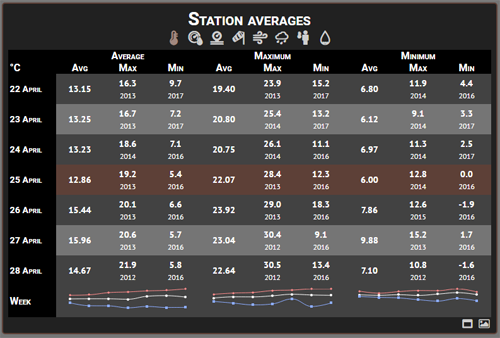 View the station averages for previous and upcoming 3 days. 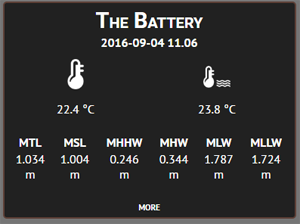 This block will show summary of all the parameters measured by your station. This includes the average, minimum and maximum. The user can change the interval (today, yesterday, this month, this year, all time etc.). The data refresh without the need to refresh the page. This block shows abs min/max measured on this day and yesterday/tomorrow (if available) and the year when this value was measured. This block shows the current status of your station. In the settings you specify the interval and if no data is in the database within that interval from now, the station will display as offline. 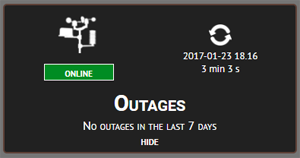 In addition you can also set it to display outages - you specify the number of days to check and it will show any periods when your station was offline in that time. 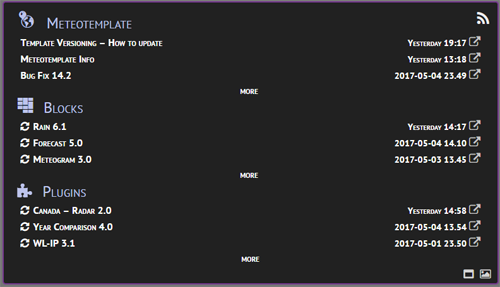 Users of the API will also see the SW type used for updates. This is one of the most sophisticated and complicated blocks. It is divided into several sections. The whole point of this block is to give a sort of daily summary/almanach of things, but not just using tables and graphs, but rather in a more 'human way'. 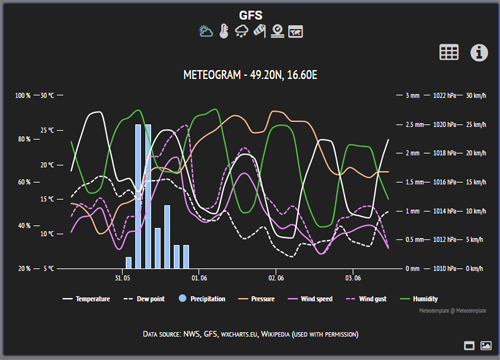 The script takes data from the database, forecast from external source and also makes its own calculations to generate a word description of various things. 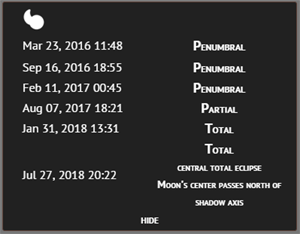 This includes current values, forecast, information about lunar and solar eclipses, Moon phases, Sun and Moon rise and set, interesting days, such as days with some weather related world records, meteor showers, season changes etc. It analyzes long-term data as well as current data. 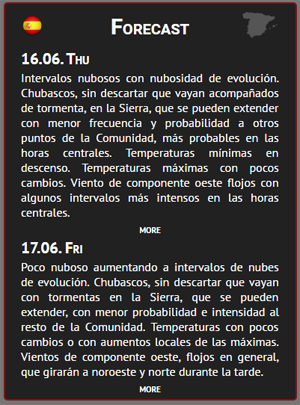 It will tell you for example what the temperatures were like today, what you can expect tomorrow based on long-term averages, it will summarize the forecast for the upcoming week and also provide lots of other information. 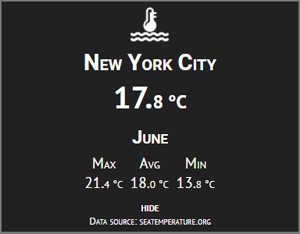 The script has algorithms that analyze the numerical data and their relationships and then generate a text such as 'based on long-term averages, the temperatures tomorrow can range between X and Y, with an average value of X, which is Y degrees more than today. The absolute minimum ever recorded on this day is X (measured on X at Y hours)'.... etc. 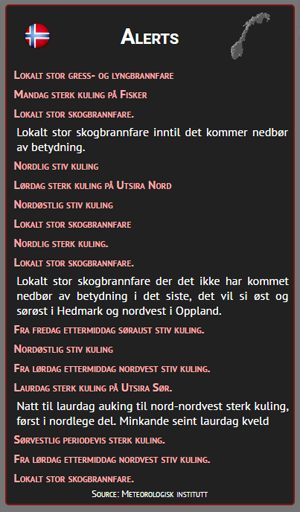 The algorithms also have several variants, which means it randomly chooses particular words and their synonyms so the generated text is always unique and calculated in real-time. The info shown obviously depends on the particular day. Below are just some example strings generated by the block and screenshots. It will of course use the units and settings based on your config.php or user selection. Today is Friday, February 19, 2016. The Sun rises today at 06:55 and sets at 17:19, which means the day is 3 minutes longer than yesterday. 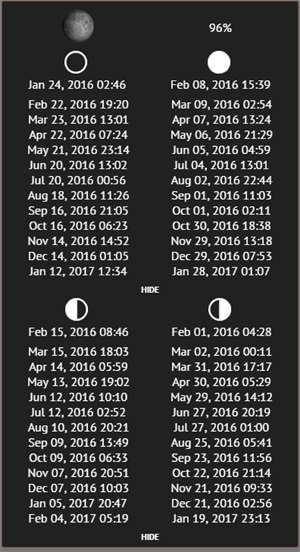 Moon rise is at 14:11, set at 04:40. The current Moon illumination is 86.4% (Waxing gibbous). It is currently 4.5°C with a SE wind blowing at 6.1 kmh and gusts of 9.7 kmh. The total rainfall amount since midnight is 11.4mm. 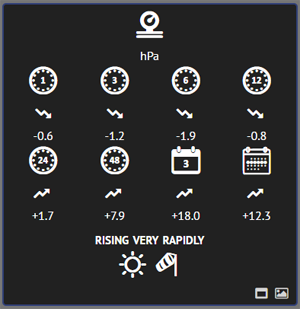 The current pressure is 1016.3 hpa and rising slowly. 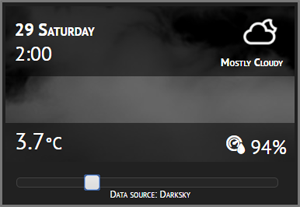 The humidity is now 99 % and dew point and apparent temperature 4.4°C and 2.1°C respectively. 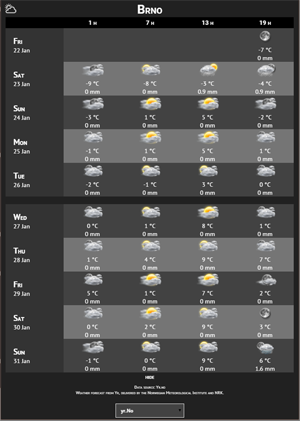 Tomorrow morning the forecasted weather condition is cloudy and temperatures around 1°C. 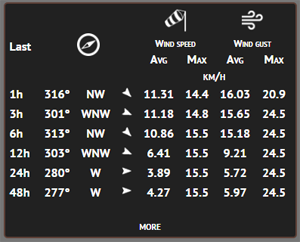 Light breeze from west-northwest with a speed of around 7 kmh. 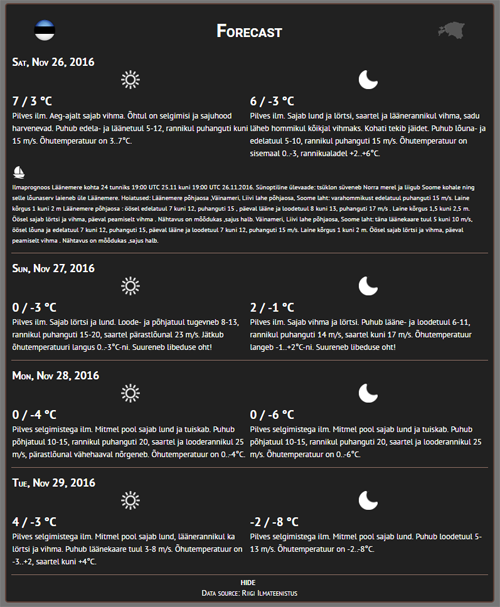 Later in the morning tomorrow, the temperatures are going to go down by about 2° to -1°C. 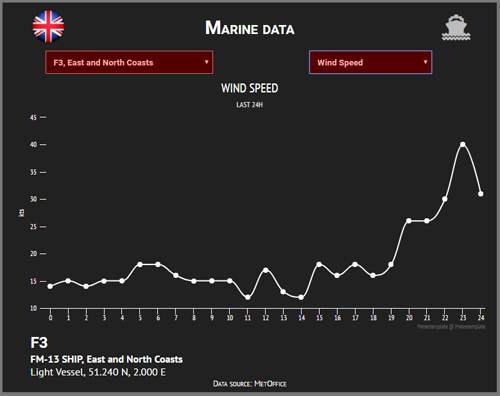 Light breeze from west with a speed of approximately 7 kmh. 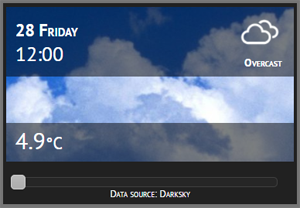 The temperatures in the afternoon are going to go up by about 8° to 7°C and cloudy. Gentle breeze from west-southwest with a speed of around 14 kmh. 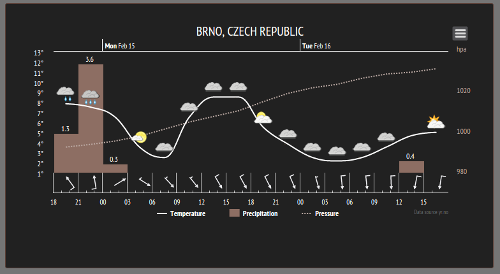 Tomorrow evening and night we expect rain and temperatures decrease to 5°. The precipitation amount should be approximately 1.1mm. Gentle breeze from southwest at roughly 13 kmh. So far the maximum temperature today has been 5.1°C and minimum 2.2°C, with an average of 3.8°C. This is 2.6°C less than yesterday, when the average was 6.3°C (max 8.3° and min 2.3°C). 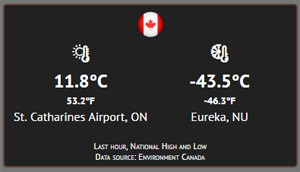 The long-term average for the station on this day is 2.7°C. Absolute maximum of 9.3°C was measured in 2015, while the absolute minimum in 2012 (-0.7°C). Therefore so far, today is 1.0° above the long-term average for 19th February. 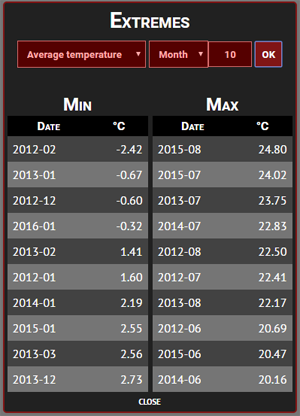 Overall monthly maximum temperature so far was 16.4°, measured on the 9th at 20:39. 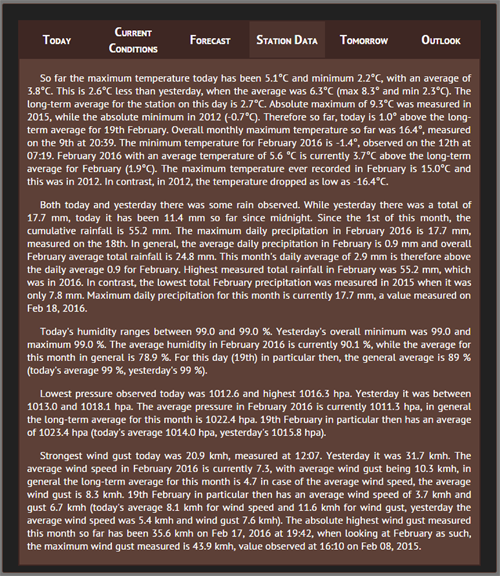 The minimum temperature for February 2016 is -1.4°, observed on the 12th at 07:19. February 2016 with an average temperature of 5.6 °C is currently 3.7°C above the long-term average for February (1.9°C). 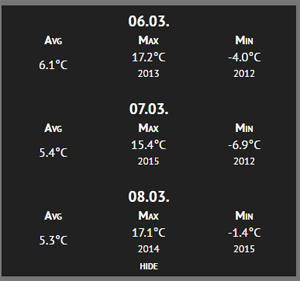 The maximum temperature ever recorded in February is 15.0°C and this was in 2012. 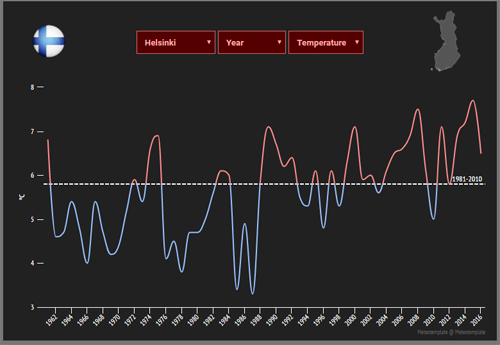 In contrast, in 2012, the temperature dropped as low as -16.4°C. Both today and yesterday there was some rain observed. 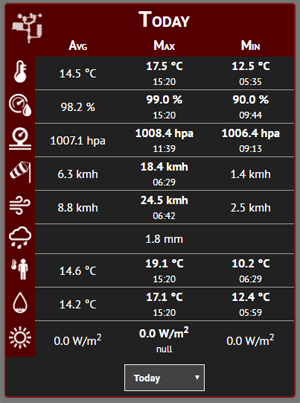 While yesterday there was a total of 17.7 mm, today it has been 11.4 mm so far since midnight. 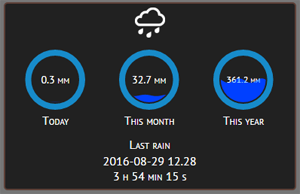 Since the 1st of this month, the cumulative rainfall is 55.2 mm. The maximum daily precipitation in February 2016 is 17.7 mm, measured on the 18th. 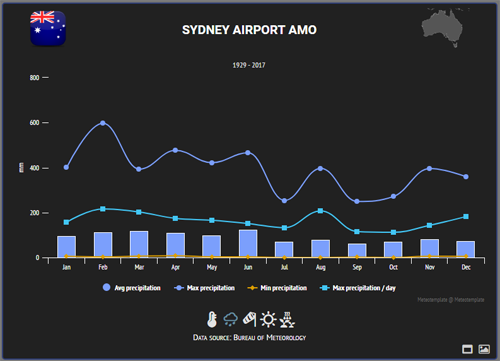 In general, the average daily precipitation in February is 0.9 mm and overall February average total rainfall is 24.8 mm. 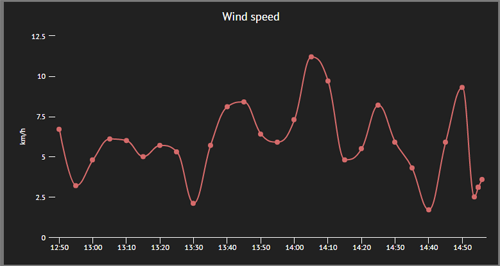 Strongest wind gust today was 20.9 kmh, measured at 12:07. Yesterday it was 31.7 kmh. The average wind speed in February 2016 is currently 7.3, with average wind gust being 10.3 kmh, in general the long-term average for this month is 4.7 in case of the average wind speed, the average wind gust is 8.3 kmh. 19th February in particular then has an average wind speed of 3.7 kmh and gust 6.7 kmh (today's average 8.1 kmh for wind speed and 11.6 kmh for wind gust, yesterday the average wind speed was 5.4 kmh and wind gust 7.6 kmh). 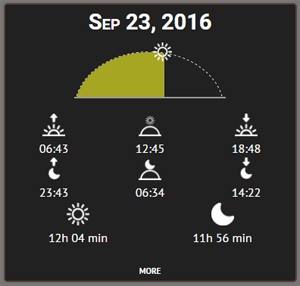 Tomorrow, on Saturday February 20, 2016, the Sun will rise at 06:53 and set at 17:20, which means the day will be 4 minutes longer than today. 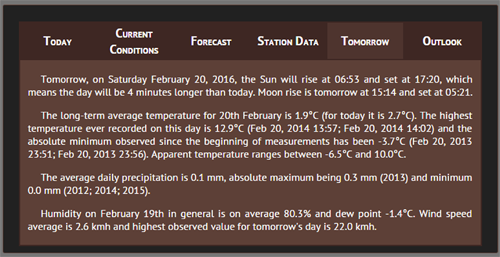 Moon rise is tomorrow at 15:14 and set at 05:21. The average daily precipitation is 0.1 mm, absolute maximum being 0.3 mm (2013) and minimum 0.0 mm (2012; 2014; 2015). 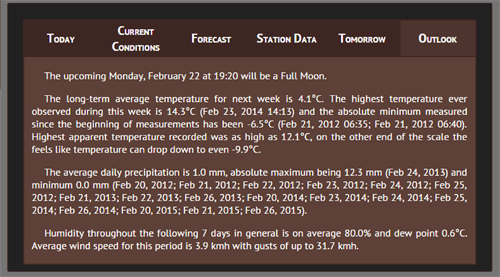 The upcoming Monday, February 22 at 19:20 will be a Full Moon. On Jun 23, 1982, the temperature at the South Pole fell to -82.8°C (-117.0°F), which is currently the lowest ever recorded temperature there. 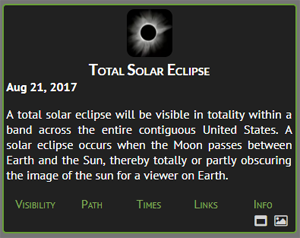 Tomorrow at 15:05 (14:05 UTC) will be a solar eclipse. It is a total eclipse, with a duration of 354s. The central path coordinates are 55N and 111W, azimuth 38° and altitude 44°. 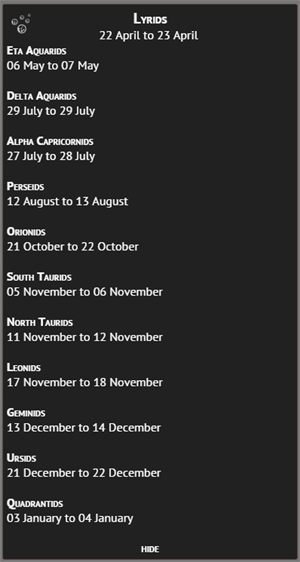 It is currently possible to watch the Leonid meteor showers, which can be observed from Nov 11 until Nov 12. Astronomical summer begins tomorrow at 4:02 AM. At 2:22 today the Moon will be in its last quarter. Animated zoomable radar image for Suriname. 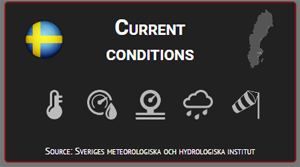 A block that shows current weather conditions for Swedish cities (temperature, humidity, pressure, precipitation, wind speed). It is also possible to sort the data from minimum to maximum and data is cached. 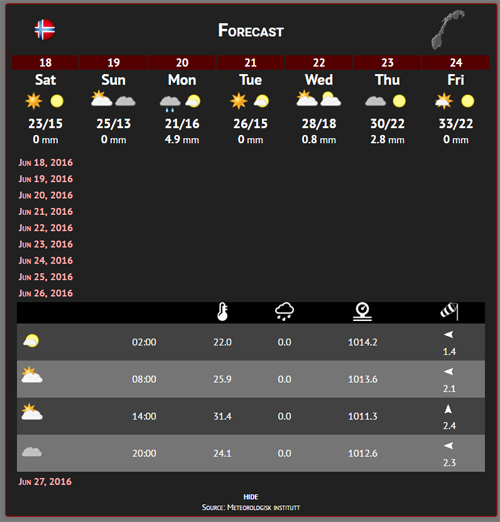 Hourly forecast for Sweden. 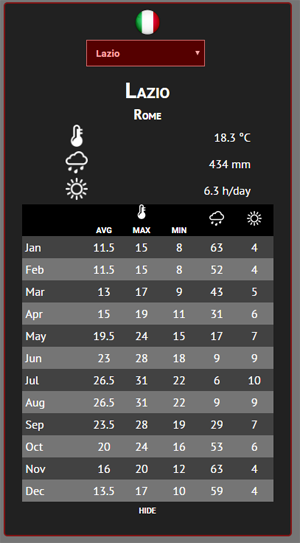 Just drag marker to the position you want and it will show you 10 day forecast including temperature, conditions, pressure, humidity, precipitation etc. 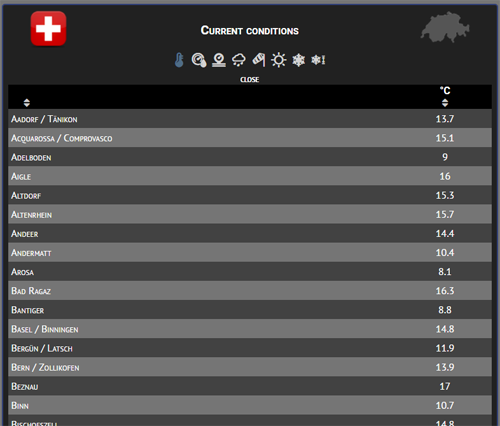 Current conditions in Swiss cities. 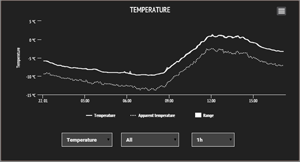 This block uses the current conditions API file to show temperature data from extra sensors. Only use this block if you have some extra temperature sensors data sent to the API. 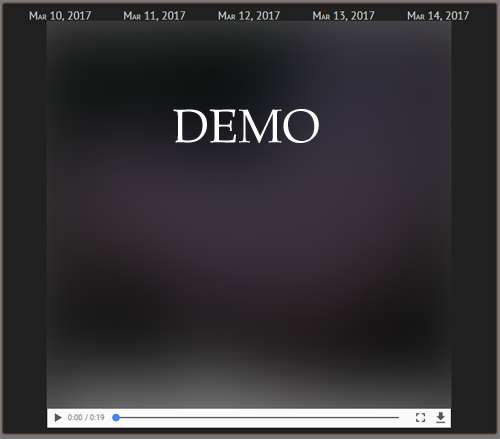 Please note - since I do not have any of these, the DEMO is static, only for demonstration purposes. This is probably the simplest block of all. Simply displays static text defined in the settings. 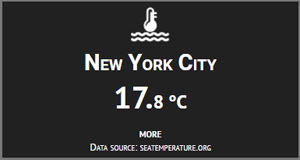 An interactive realtime updating customizable thermometer. 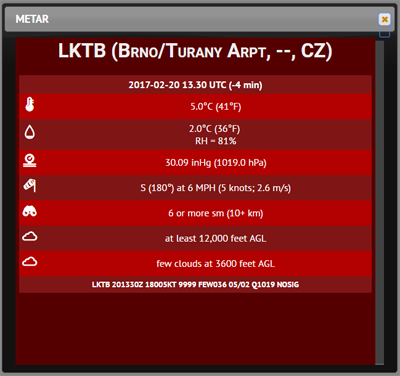 Set the update interval (via database, cumulus realtime, weather display clientraw, weather cat etc. 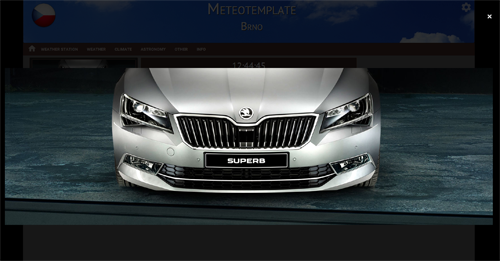 ), specify min/max, animation type, size, scale type etc. 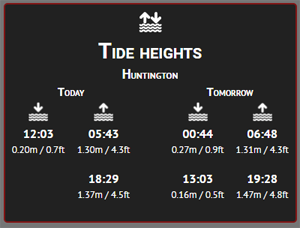 A block for showing high/low tide times for today and tommorow (simplified version of the tide heights plugin). 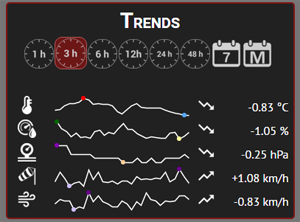 This block shows you trends in various parameters. There is a little smoothened line graph and the overall trend for the selected period. This block shows random interesting facts about weather, astronomy etc. There is a default set of strings, but you can easily change them or add your own by modifying the string text files. 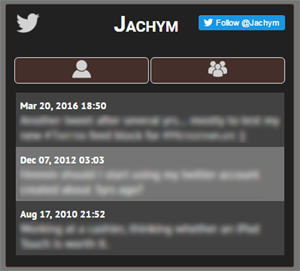 This block connects directly to the Twitter API and allows you to display your and your friends' tweets, using the styling of your template and also caching, which speeds things up. You can also specify the maximum number of tweets to display. Instructions how to set it up are given in the settings.php. 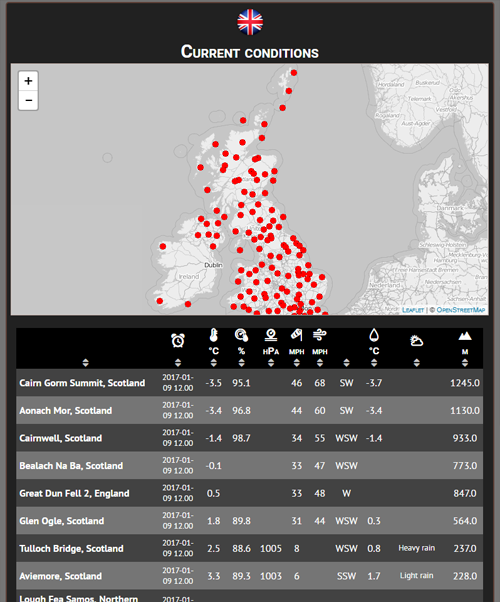 Current conditions in the UK cities, shown on a map as well as in a sortable table. 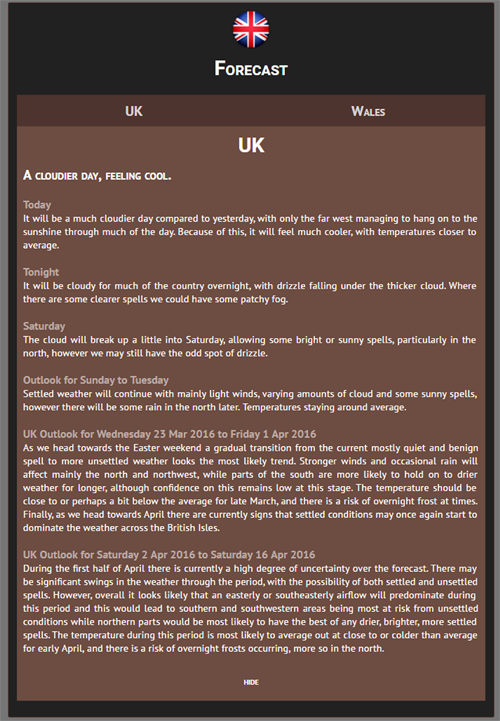 A detailed regional/national forecast for the United Kingdom. 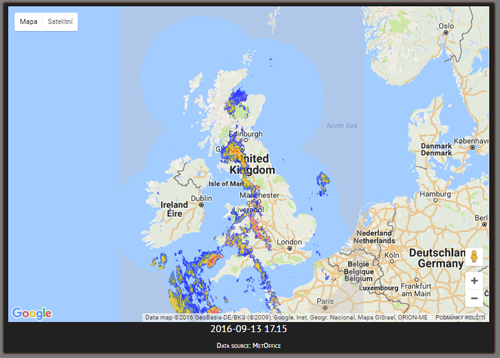 Radar for the UK, which is displayed as a map overlayed so can be zoomed easily. 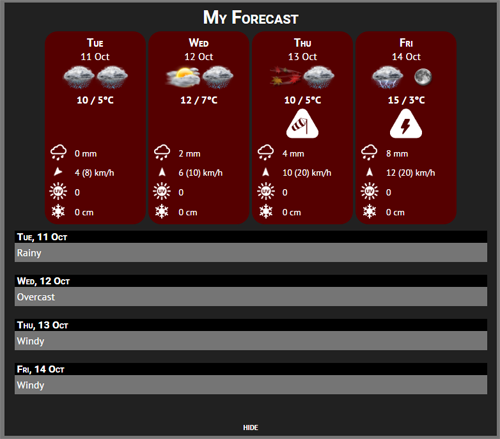 Images are provided by MetOffice, so you will need to get an API key if you already don't have one (free registration). 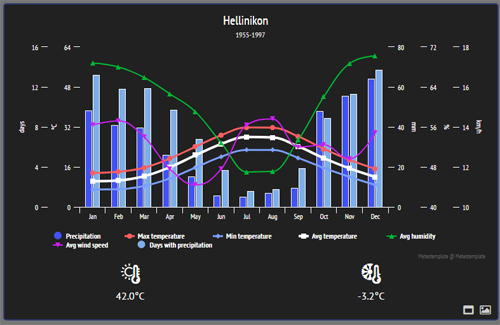 Long-term data for professional Metoffice stations (max/min temperature, precipitation, sunshine hours). 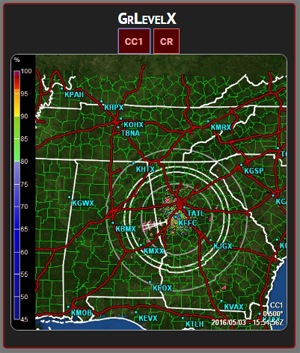 This block adds the national and regional radar images from the U.S. You can choose the default regional radar and the user can then select any other one. 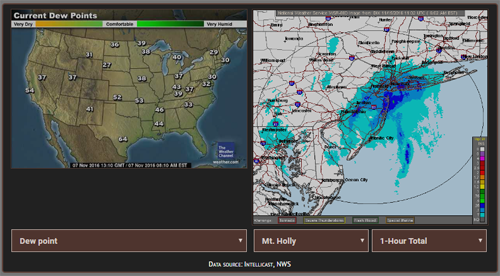 The national radar includes images such as temperature, infrasat. 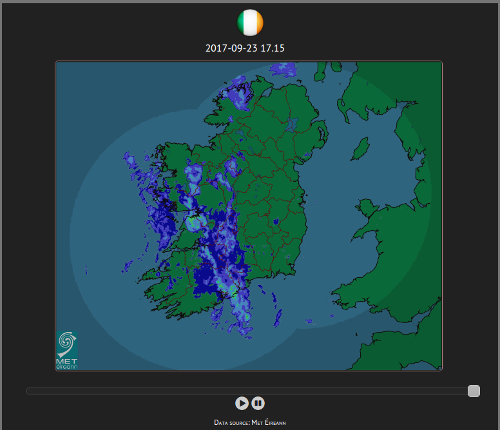 precipitation etc. In the settings you can also specify how to align the two images. 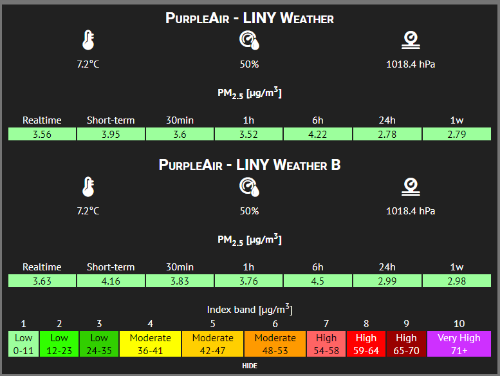 This block shows the current air quality. 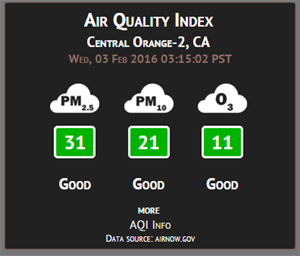 In particular it gives the air quality index (AQI) which is based on the concentration of the particular pollutant. 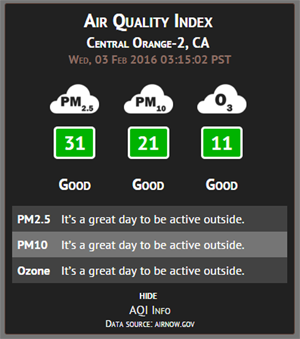 It gives information about PM2.5, PM10 and ozone, depending on data availability (data source: airnow.gov). You can also view more information about what the current value means and there is also a general information about these pollutants and the individual limits. This block allows you to specify unlimited number of cities in the United States and show their current conditions. 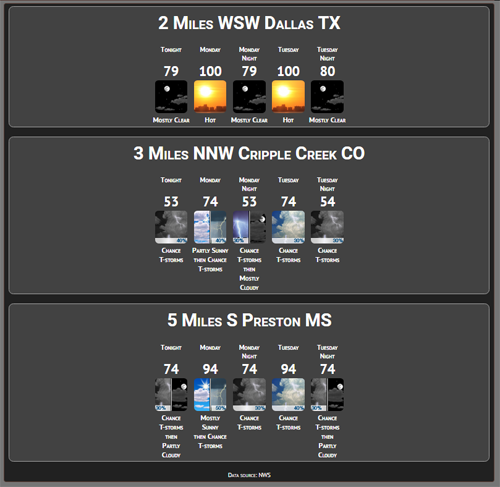 Data is loaded from the NWS, cached and there are a few other parameters you can set. 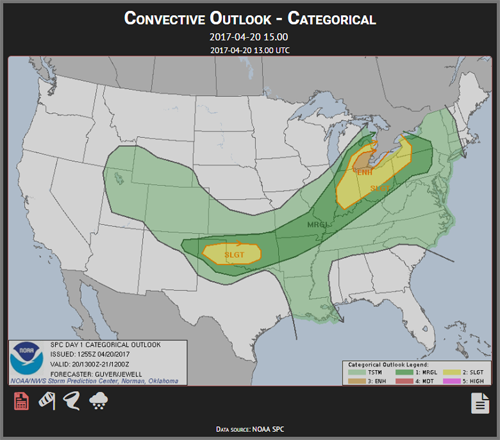 This block show convective outlook as well as forecast discussion using data from the Storm Prediction Center. 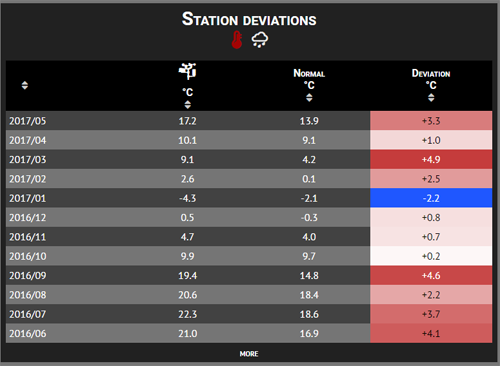 This block shows current water level and temperatures for stations in the U.S., provided by the NOAA. In the setting you specify which station you want to use, which units to use and cache time. 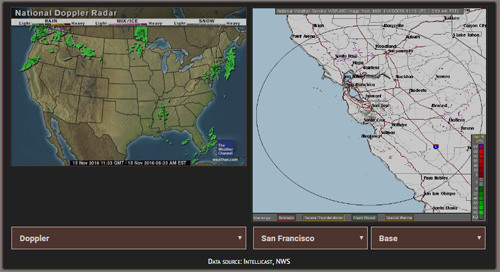 A block for the GrLevelX that allows you to show the latest GrLevelX software generated radar images on your homepage. The images will autoupdate without the need to reload the site and also show a message if the image files are outdated. 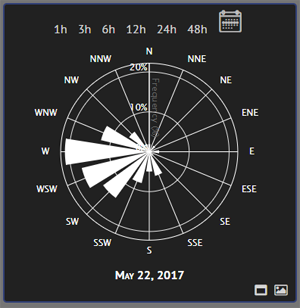 This block is for displaying forecast from NWS (i.e. only for US users). 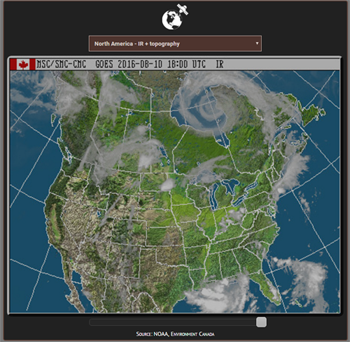 This block shows a map where the user can choose a point in the area of the United States and it will show them the NWS forecast for that place. 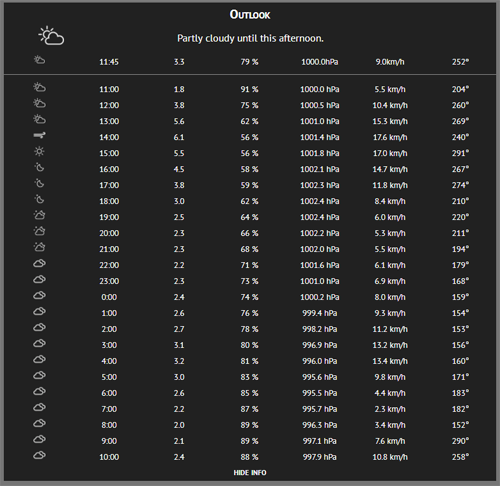 If you only want to show forecast for your location use the nwsForecast block instead, this one does not use caching and therefore will be slower. This block works just like the nwsForecast, but instead of using your station coordinates, you can specify different coordinates and you can specify more than one location. 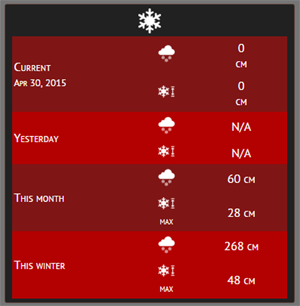 In addition, you can limit the maximum number of icons/forecasts displayed. Compact mode is available if you want to place this block in a wider column. 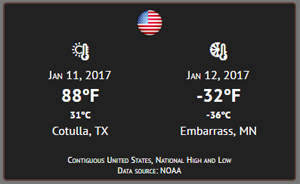 This block shows you the most recent daily high/low temperature for the contiguous U.S. including history data and an interactive map. Specify your state in the settings and the block will show if there are any warnings issued. Specify your zone code in the settings and the block will show if there are any warnings issued. 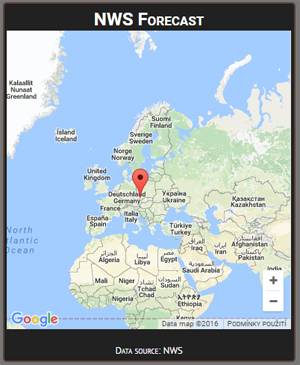 From version 3.0 it is also possible to set multiple locations. 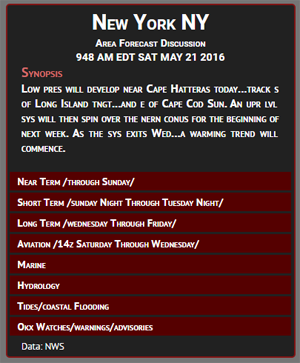 A block for NWS area forecast discussion for the U.S. 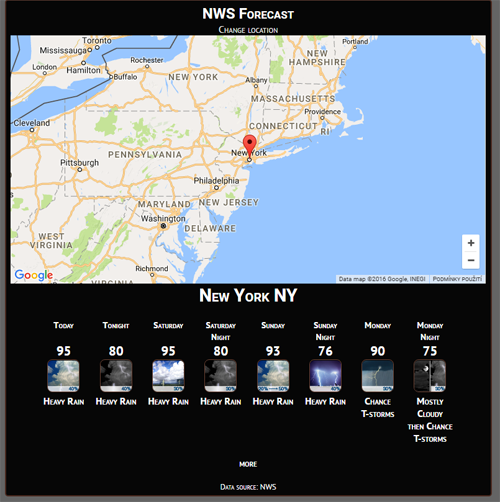 Choose from thousands of official stations around the U.S. and this block will show you the weather normals for this location, including average, maximum and minimum temperature, precipitation, snow depth, snow fall and degree days. This block shows the Top 10 locations in the U.S. in terms of snowfall amount. 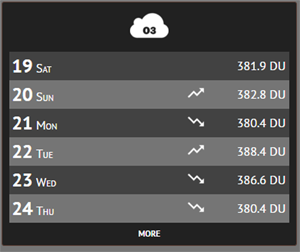 This block shows averages and forecast for today and tomorrow. 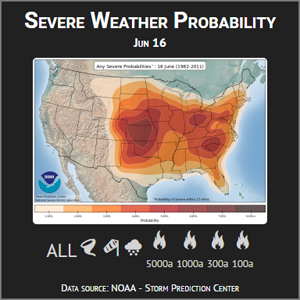 This block shows map of extreme weather probability for the current day (composite, tornado, hail, wind, wildfire). This block uses UV sensor data from the API file (only use this if you have the UV sensor and this info is available in the API data file). 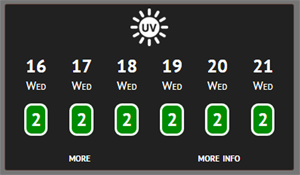 A block showing 6-day UV forecast for your station location. Display unlimited number of MP4 videos providing just their URL and title. 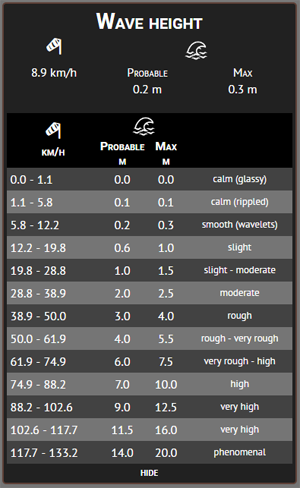 Wave height based on current average wind speed, with a table of values. 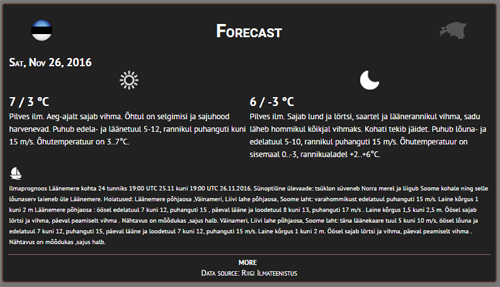 This block will add icons and direct links to the weather networks where you send data, based on the settings you made in your config.php. Using this block you can add images from your webcam(s) to the site. There can be unlimited number of them and you can specify the auto-update interval. 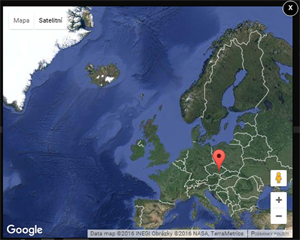 Also includes a map with the position of the webcam. This block is dependent on the Webcam plugin. 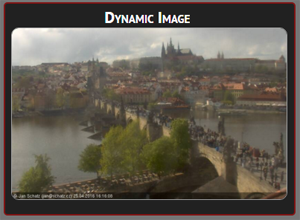 It loads all images available from today and shows them in a timelapse. 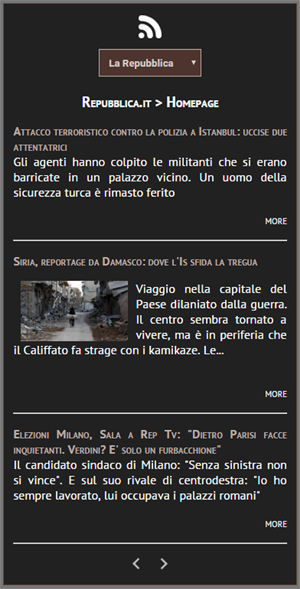 If no images are found for today, the block will completely disappear from the homepage. 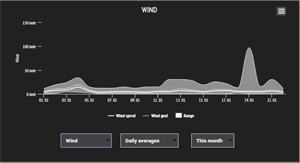 This block allows you to specify intervals (in hour steps) for which the block will show prevailing wind direction, avg/max wind speed and avg/max wind gust. There are graphs included as well and you can customize many things such as graph line color, width etc. 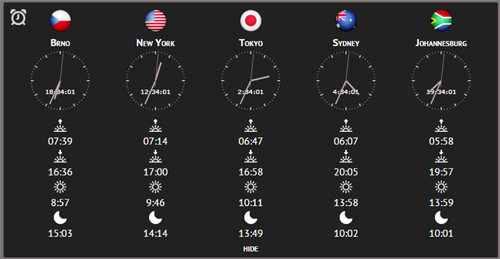 This block shows the current time in the cities you specify, when expanded also shows the times of Sun rise and Sun set. 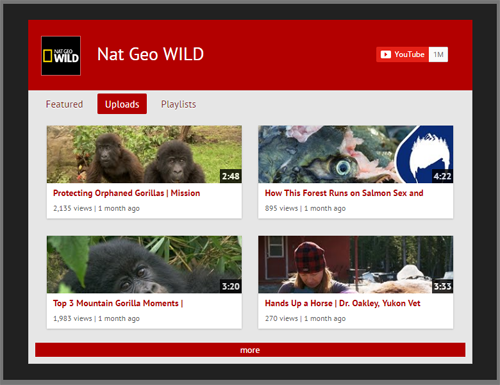 This block allows you to choose any YouTube channel and playlist and display its videos directly on your page. 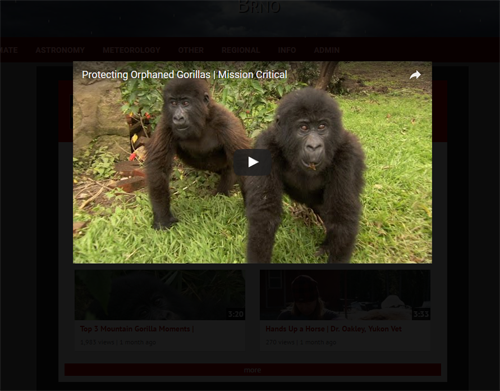 The videos are also played directly from the page without redirecting to youtube.com. If the download link does not trigger the download check your browser popup blocker! If you like this template and find it useful, please consider making a small donation. The entire template and plugins, including support is absolutely free and all contributions will go towards covering the costs associated with running this webpage.